I’ve been wanting to try my hand at drawing on fabric with Sharpie for a while to create some fabric with an unique print to sew into clothing for Eli. I just kept assuming the ink would bleed and I wouldn’t be able to get any crisp lines and so I never really have gotten around to actually experimenting. While using a pair of my old khakis to sew him some new trousers though I looked into the waste basket and realized I was throwing away small scraps that would be perfect for trying out my idea. I sketched a few things and then realized I could put my little experiments to use making Christmas ornaments! These are quick, fun and easy. As for subject matter you are limited only by what you can draw within a little circle. 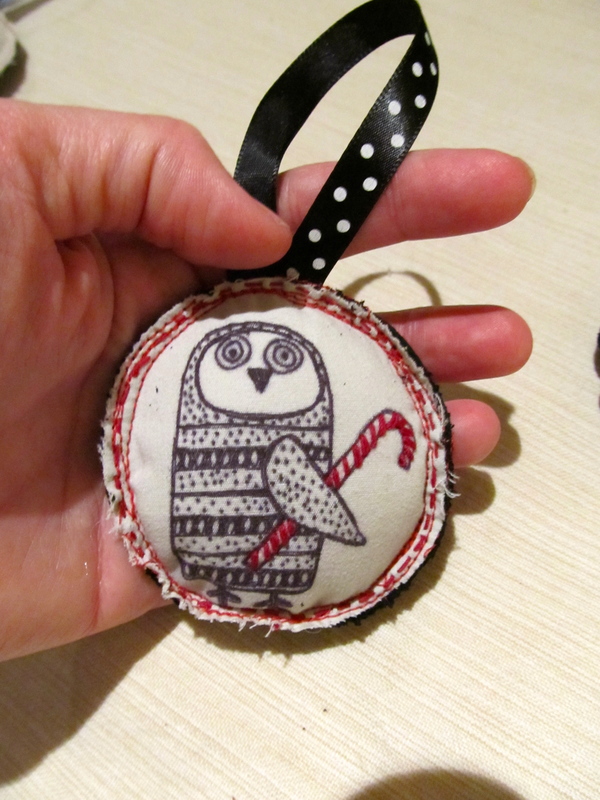 I made some owl themed ornaments just because… what’s not to like about owls?! Then I made some ornaments for my nieces based on their personal interests. Choose some scrap fabric. A tight weave works best. 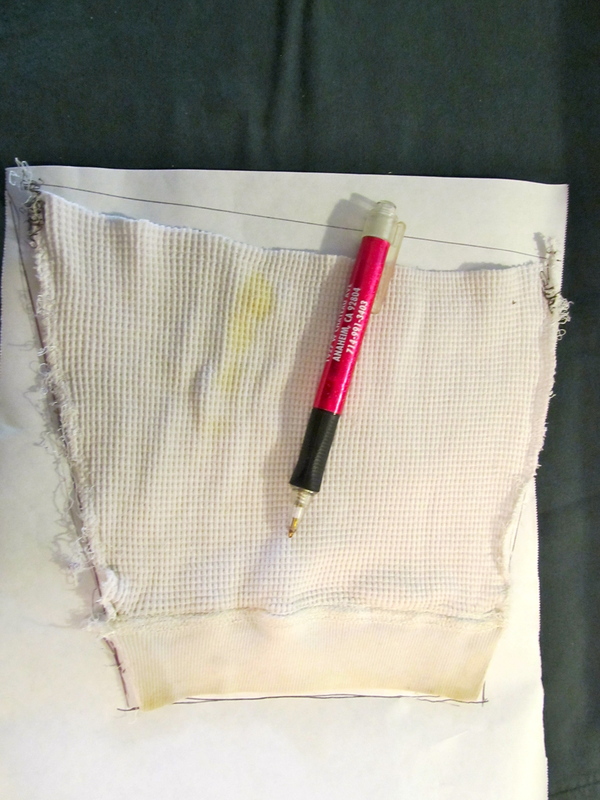 Trace a circle in pencil onto the fabric. I used a biscuit cutter and that seemed about the perfect size for the ornaments I wanted to make. 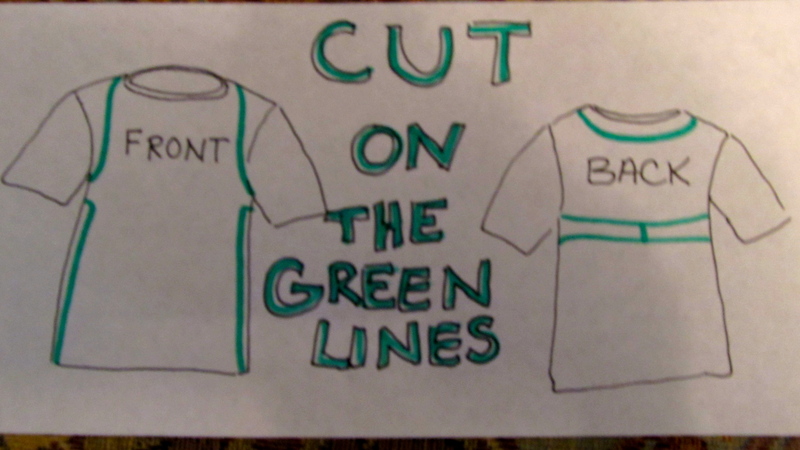 Draw the designs you want onto the fabric with your thin point Sharpie. I’m embarrassed to say that most of these owls I copied from a search I did on Pinterest. I went back to find the sources to give credit where credit is due, but a couple of weeks have passed and the old search results aren’t coming up. Shame… If you recognize your design here or know the source please let me know! The candy cane owl was holding a little bouquet of flowers in the original source. 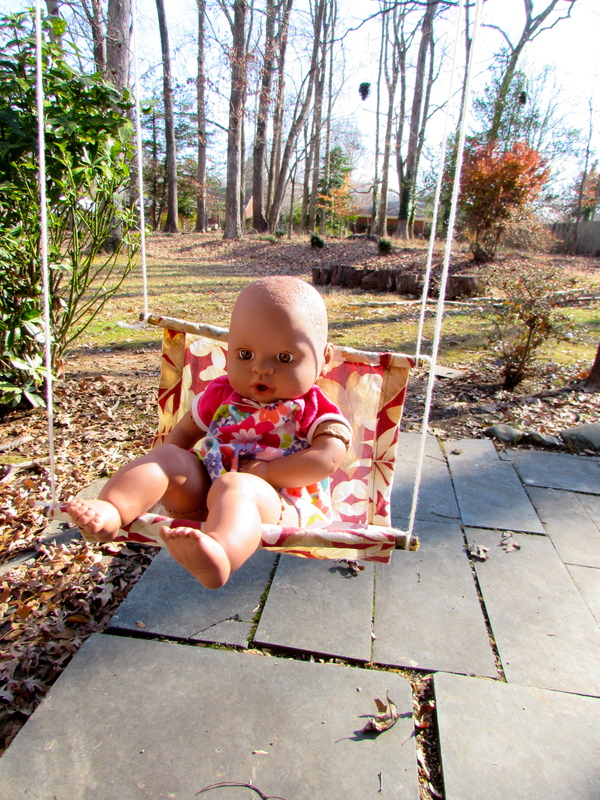 If you wish you can add a little bit of acrylic or fabric paint. Here is the point where I forgot to take pictures, so bear with me! I cut identically sized circles from scrap leather for the back of the ornament. 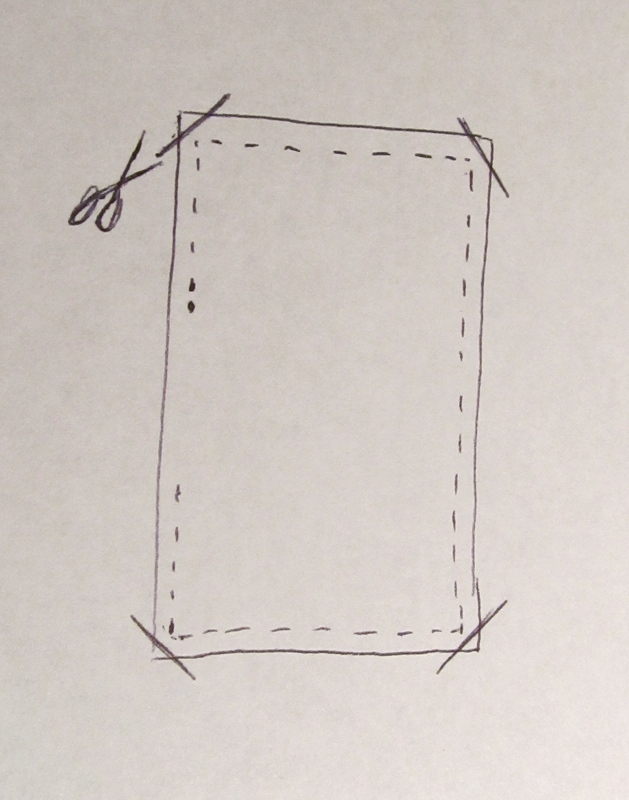 You could use fabric and sew right sides together, then turn right side out before stuffing if you want. I liked using the leather because it is thicker and I wanted my sewing lines to become part of the design. I put a doubled length of ribbon in the seam at the top of the ornament before sewing it and started sewing nearer to the bottom of the ornament. I went almost all the way around the circle with a 1/4″ margin and stopped. Stuff the ornament through the gap you left in your stitching. After the ornament is stuffed I sew around and around the outer edge making a line that looks a bit like you scribble-doodled a circle. On this ornament I then went back in and embroidered the candy cane stripes and a thicker red dashed line around the outside as well. Here are some of the other ornaments I’ve made in this style so far. 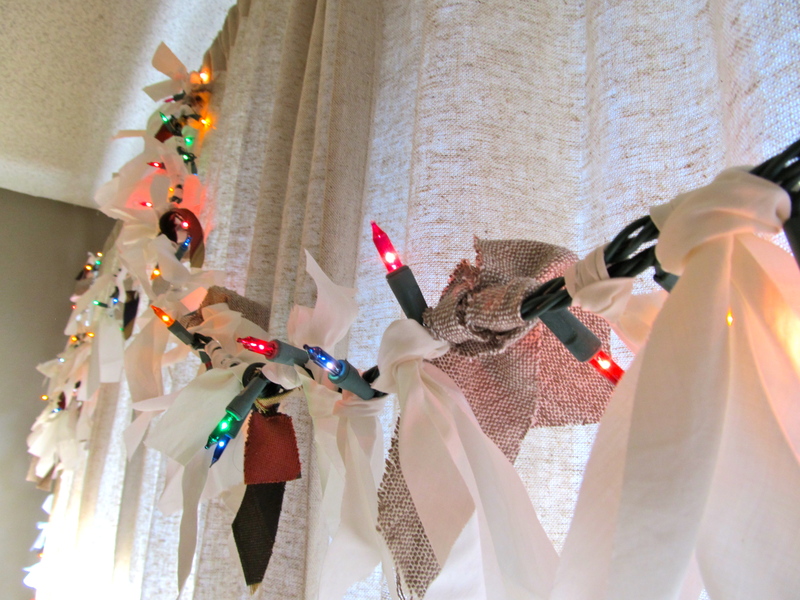 I saw a lighted garland here at ADD Housewife a few weeks ago and thought it would be a perfect way to further decrease my overwhelming stack of fabric for repurposing. After Eli left for preschool I quickly gathered my supplies. 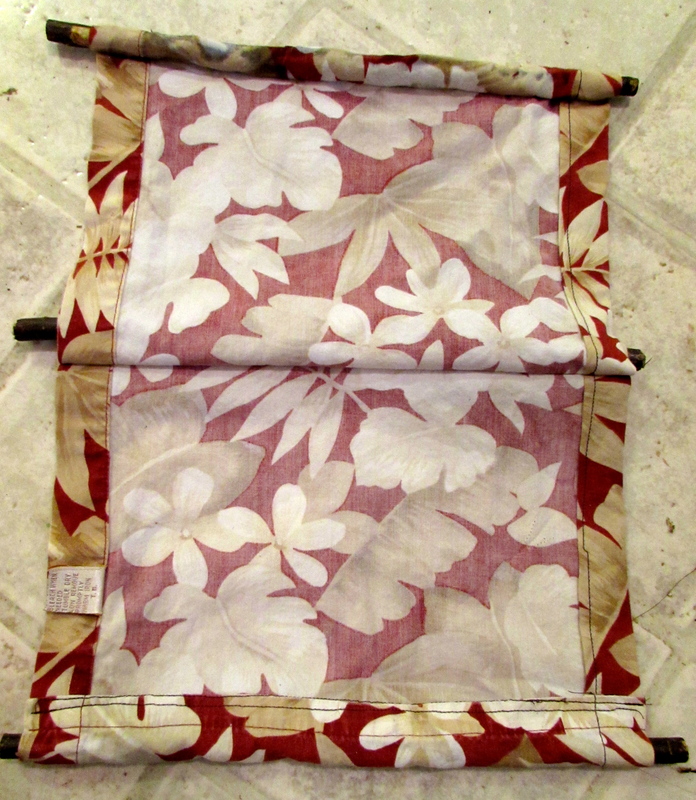 An old sheet – There are a few pieces of shirting fabric left over from long ago quilt projects and as I worked I included a couple of contrasting fabrics as well. 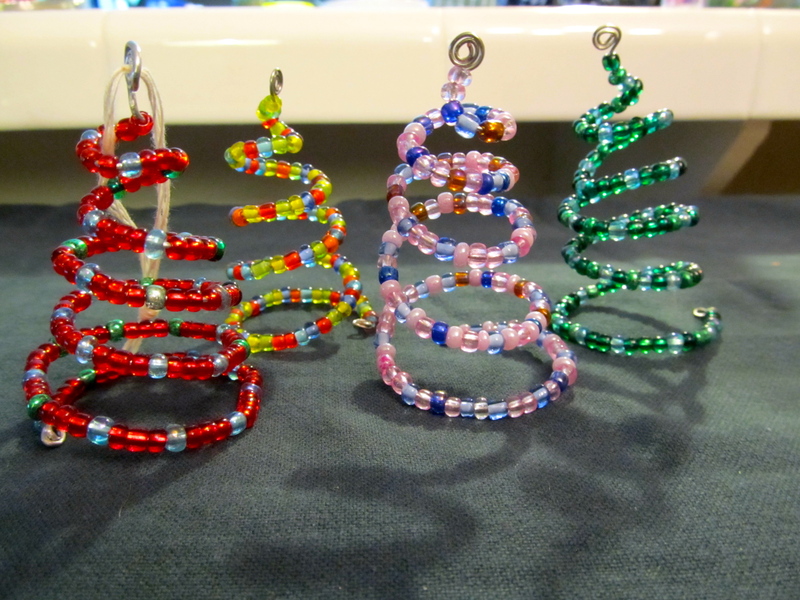 A strand of lights – I later added a second alongside to make it extra bright and colorful. My stands were 100 light strands as I wanted to hang this around the patio doors If you are making this for a mantle go with a 50 light strand or fold your 100 light strand in half. Cut strips of cloth. 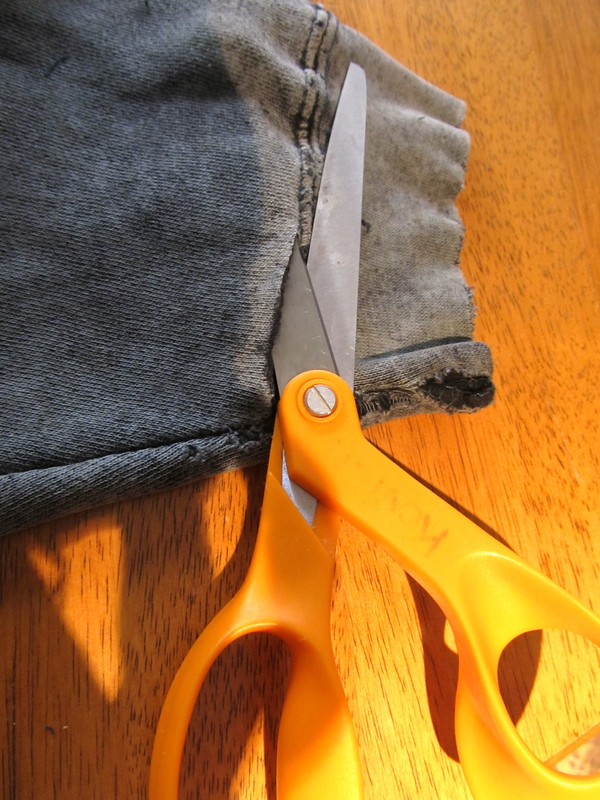 Since I didn’t have the pinking shears and didn’t want tons of shedding I cut my cloth on the bias. Actually I was too lazy to find the actual bias, I cut it in a generally diagonal fashion. It worked. I cut most of the strips 2″ wide and of varying lengths from 5-10″ long. 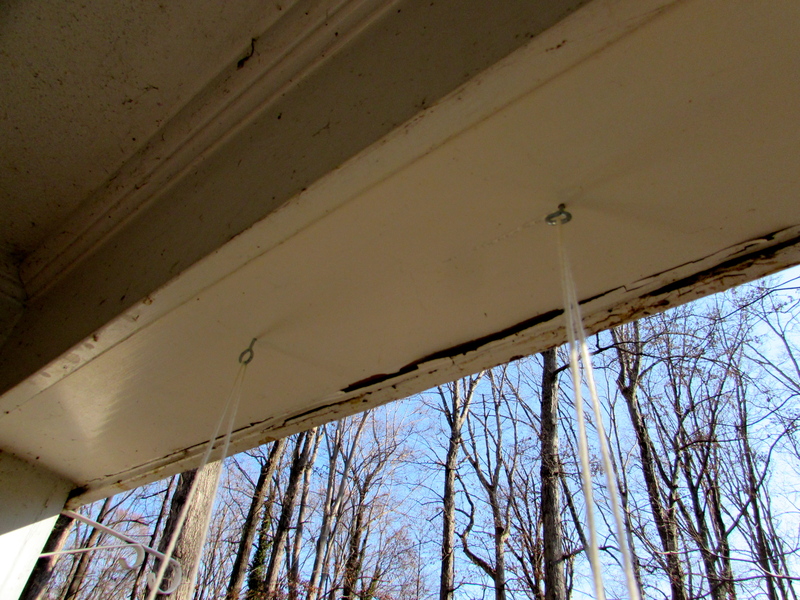 I didn’t measure the lengths… just eyeballed and hacked. 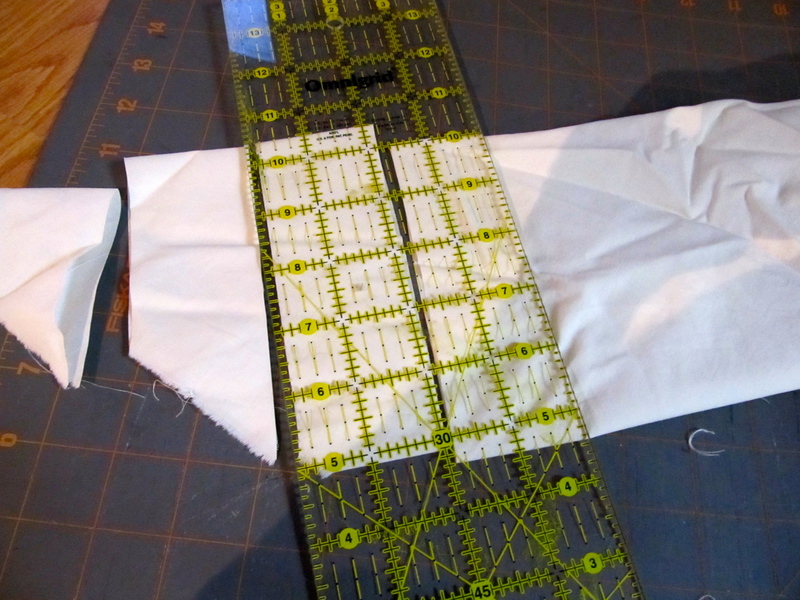 I later cut other fabric 1″ in width to fill in bits of wire along the length with the thinner pieces as needed. I also chose to add some other fabrics of contrast as I got going. The darker of these I also cut to 1″ width. 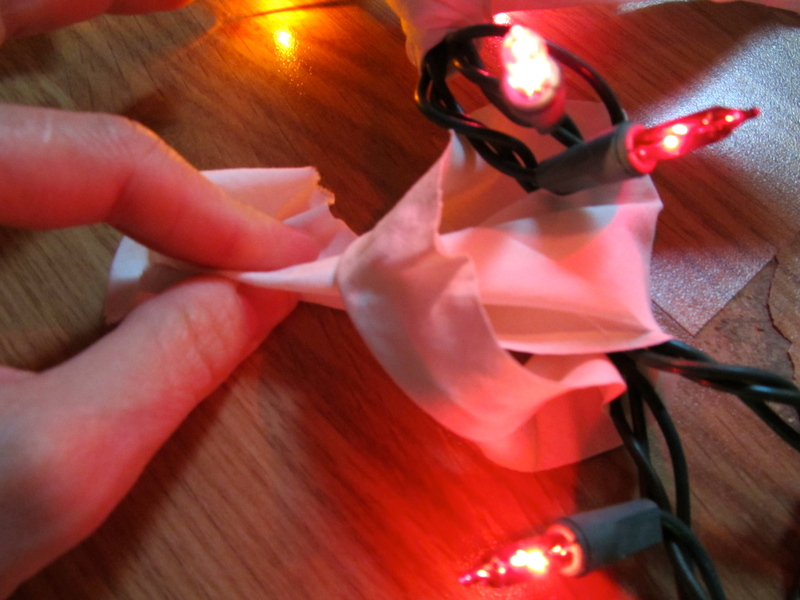 Fold a strip of cloth in half, bring it around the wire and pull the tails through the loop. I worked along the length of wire by putting the fabric on, jumping ahead a few inches before adding more and then doing the same thing back and forth again down the wire. 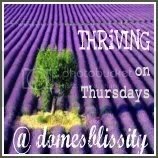 This way I could better gauge where I wanted to put thicker verses thinner strips and longer verses shorter. I was also able to work in my accent fabrics a little more regularly than if I had just started at one end and worked all the way to the other. Excuse the off center photo. Our tree’s lights at the very top decided not to light this year and we are only midway through rectifying the situation. I didn’t really want to showcase our tree in it’s current state on the blog. When the garland is as full as you want it to be hang ‘er up. Yeah, three steps. It really is that easy. I may go back in later and further cover up the bits of wire that still show. Once you step back it’s not so noticeable though and I was out of fabric from that particular sheet. The jury is still out as to whether the strips of darker fabric will remain or not. Now you can really vary your look for these garlands through fabric choice, light color choice, using uniform length strips verses untidy multi length strips. 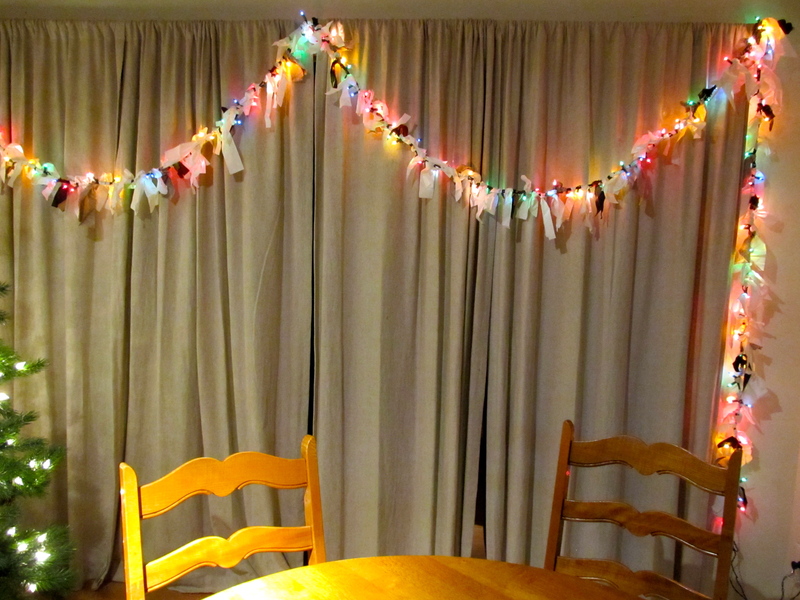 ADD Housewife mentions on her blog that she has made many of these corresponding to different holidays… because of course, garlands aren’t just for Christmas anymore! I’m finding as the seasons change (we’re slow about season changing here in Southern CA) that Eli has outgrown most of his existing long sleeved shirts. I’m trying to go the frugal route these days and as he has plenty of short sleeved T-shirts that fit him well I decided to try adding long sleeves to them. I started with this shirt. Yea, already has long sleeves, but they were at one time in the distant past white and no amount of laundering or stain treatment is returning them to their former glory, so this shirt had been pulled from rotation some time ago. The shirt itself is fine though and one of Eli’s favorites, so we’ll just switch out the sleeve. 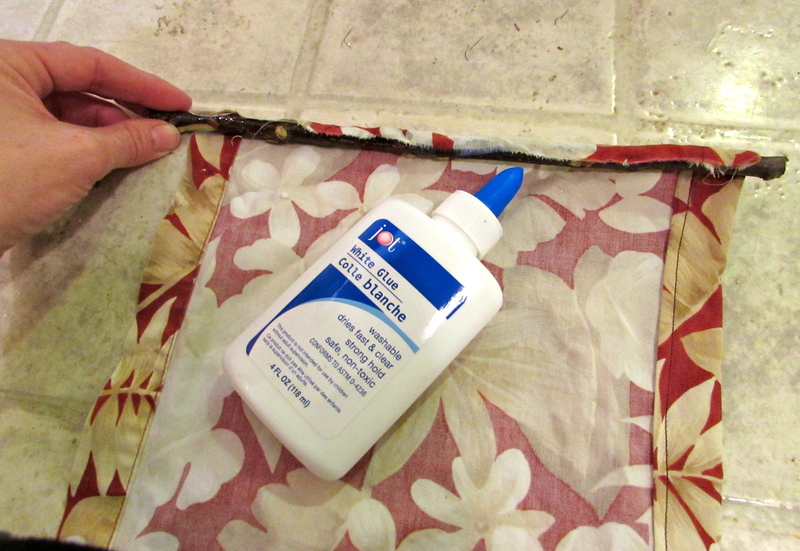 Carefully clip it free… so much faster than seam ripping! 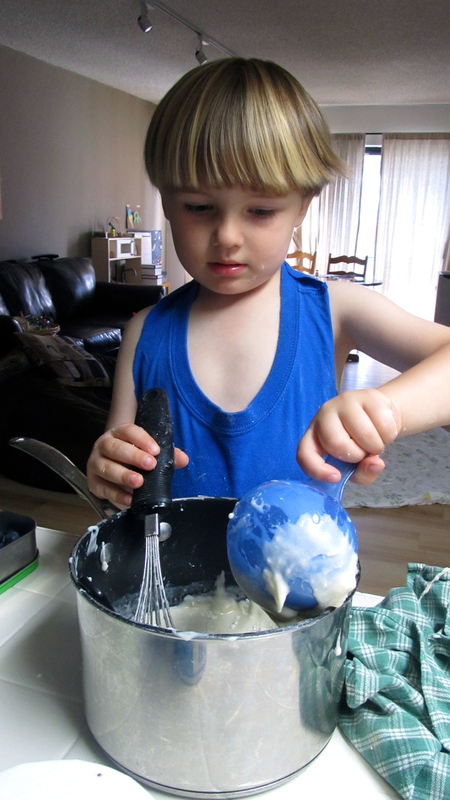 Open it up and trace it onto freezer paper to make a pattern. 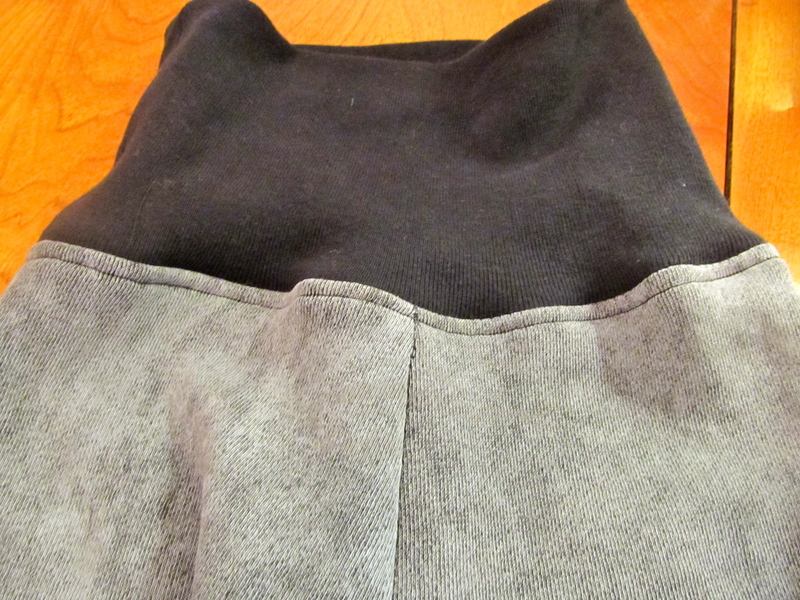 I did seam rip the side seam to preserve the side seam allowances. 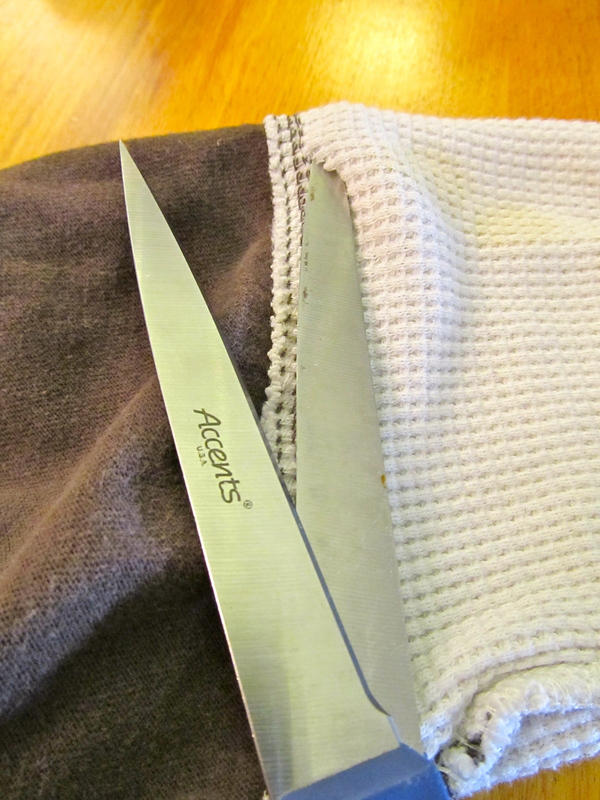 Add 1/4″ at the top to account for what was left behind when cutting it from the shirt. 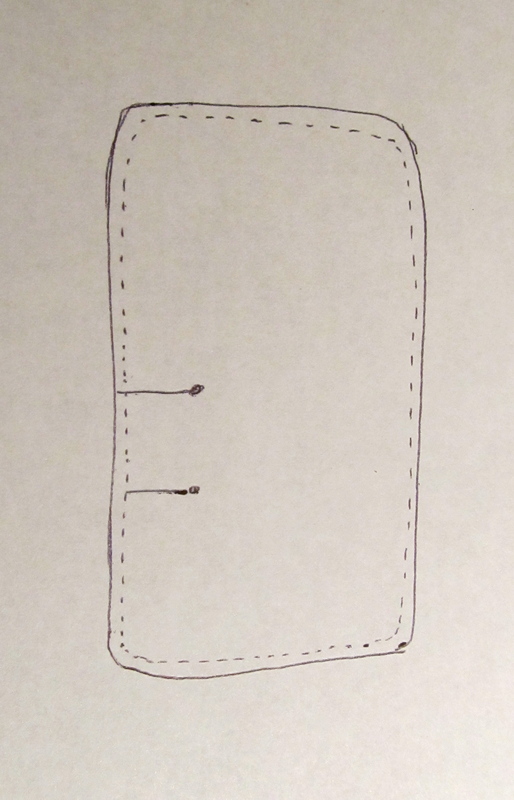 (I think you could probably make a pattern easily enough by tracing the sleeve of a long sleeved shirt still attached, doubling it mirror image and adding a seam allowance.) Leaving the bottom without allowance for hemming was on purpose as I plan to use the hemmed bottom of another t-shirt for the sleeve. Open the side seam of your sleeve a little ways. Sew the top part of the long sleeve to the bottom part of the short sleeve. This can be done by machine. I did it by hand as I was out of brown thread that would have blended in with the existing serged line of stitching and I thought a contrasting machine stitch would just look tacky, especially if I wavered at all which often happens with me. 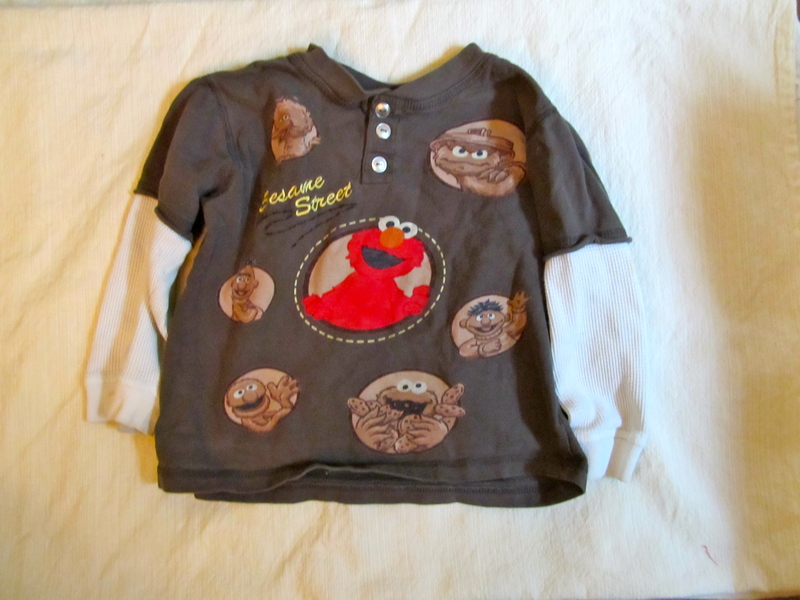 I also liked that the front of the shirt has an embellishment of brown embroidery, and a printed-to-look-hand-embroidered line around Elmo. On the sleeves the darker red stripes are machine embroidered, so I thought carrying the motif over to the attachment of the sleeve with a little pop of red might be fun. Pin and sew up the sides of the sleeve. For this I did use the machine. (Use a zigzag stitch). Turn right side out and enjoy the “new” shirt! 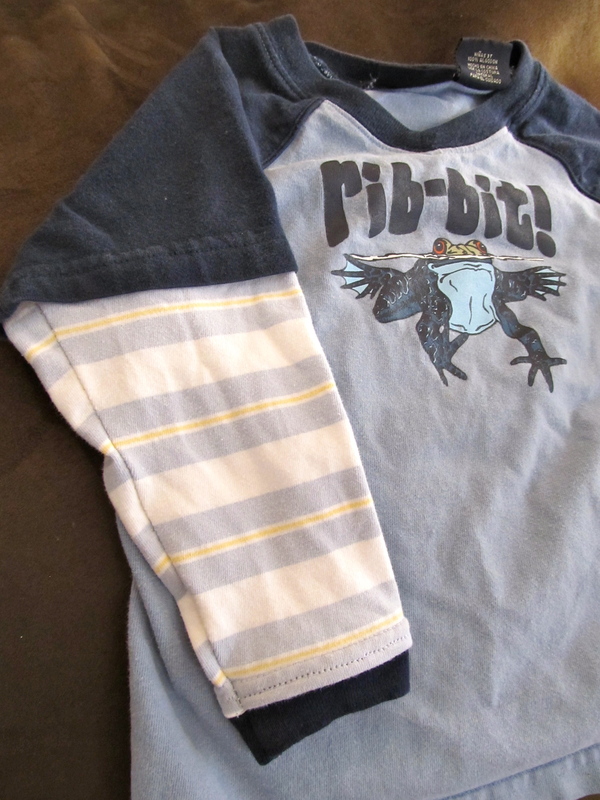 I also used the same pattern piece to make long sleeves to add to a short sleeved t-shirt. This time I sewed up the side seam of the sleeve ahead of time and then attached it to the short sleeve by hand. I did it this way simply because I didn’t feel like ripping open the side seam of the short sleeve and I knew I was needing a little handwork to bring along with me for a time I knew I’d be sitting around waiting for Jeff and Eli. The dark blue on the bottom is just some left over neck ribbing from another old t-shirt that I added for an extra pop of color. 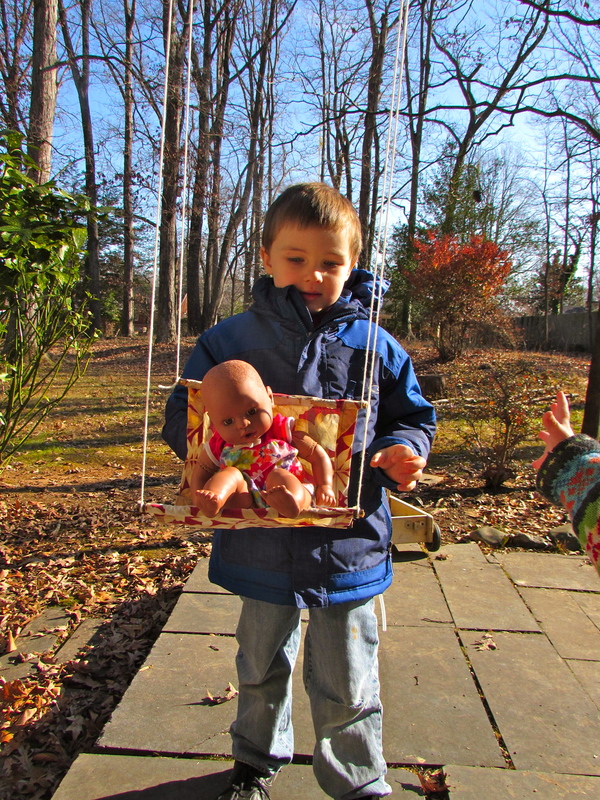 I hope you find this tutorial helpful in extending your little one’s wardrobe through another season. 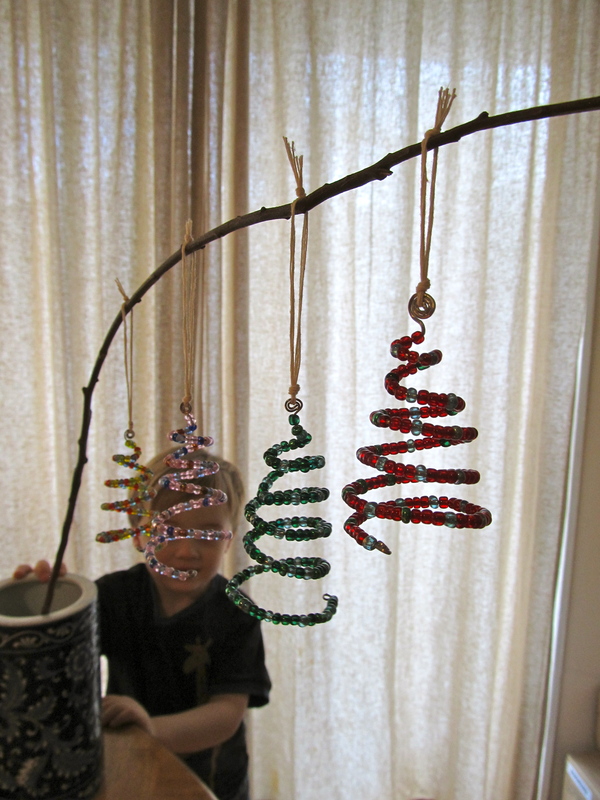 These Christmas tree ornaments are quick to make and require just a few materials. 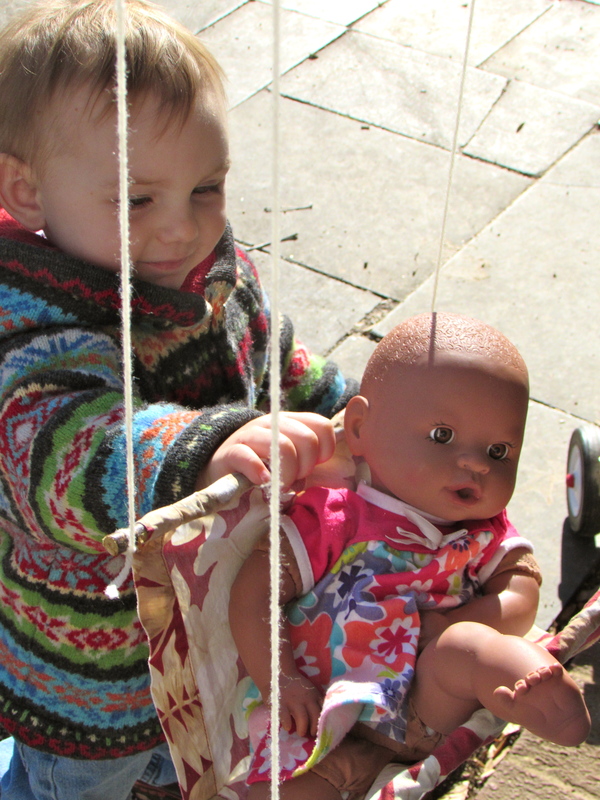 It is a project that could be easily done by older children as well. 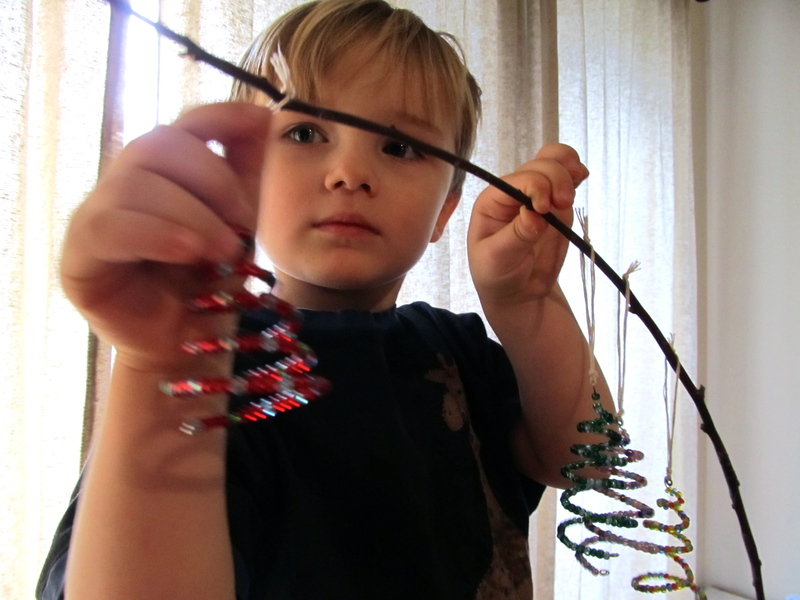 Cut off a length of wire that will be a bit longer than you need to make the coil of your finished Christmas tree plus a few twists at the beginning and the end. Using the needle nose pliers make a little curlicue that will be both the decoration at the top of the tree and the hanger attachment. 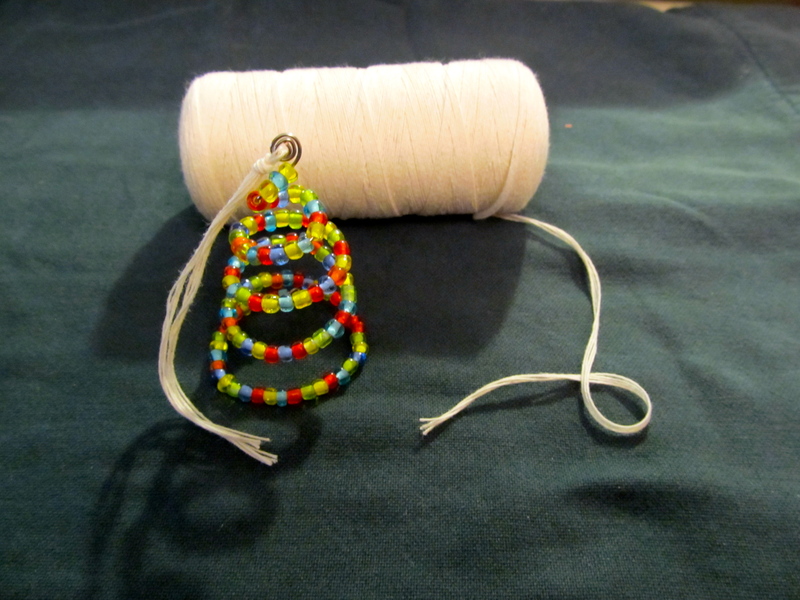 Begin stringing the beads along the wire. You could do it in a repeating pattern of colors or randomly as I did. 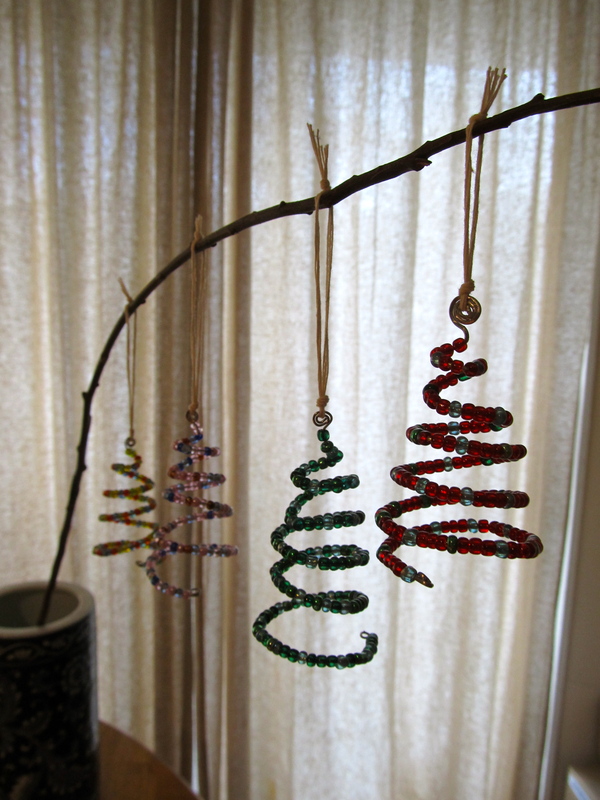 You are now ready to begin coiling your tree shape when you have about 2/3 of the wire filled. Just begin to twist it with your fingers in gradually larger circles. You don’t need to fiddle with it a lot at this point; just determine how much larger you are going to want to make your tree. You will adjust the coils to be more aesthetically pleasing at the end. 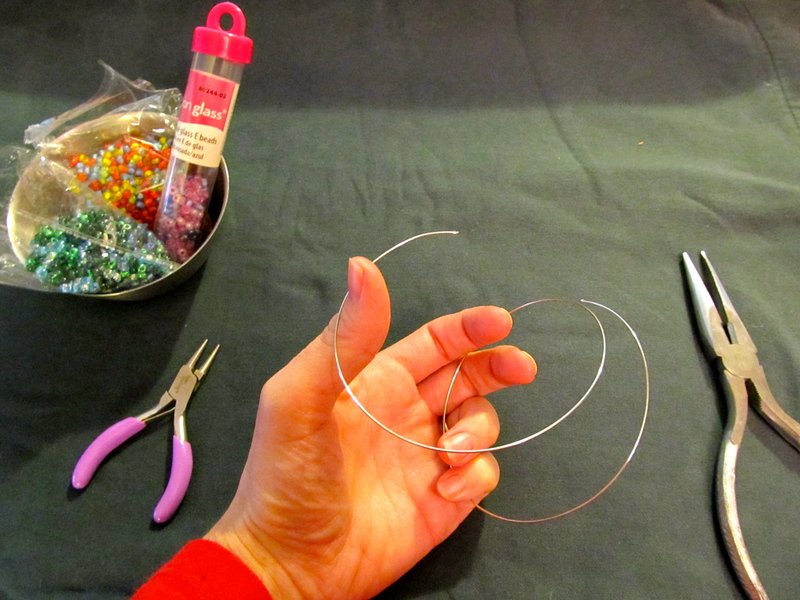 Once you’ve reached your ornaments desired size cut off the extra wire, leaving just a bit to bend into a curlicue to hold the beads on the wire. Now begin adjusting your coils. Are you aiming for the perfect shape or a touch of whimsy? Repeat the process to make as many trees in as many color combinations as you would like. Add the style hanger of your choice. I chose to use candle wick yarn for a simple hanger as I felt my usual beaded hanger would detract from the tree ornament itself. Hang up your ornaments! 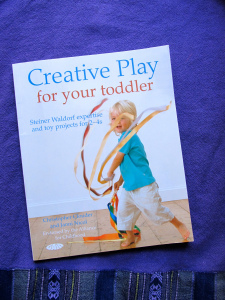 You may find that any photo sessions you may wish to have with your new ornaments are more easily had without inquisitive 2 year olds in the room. Sticks are always fascinating of course. It might get a bit misshapen but the ornament does hold up fairly well to toddler abuse. 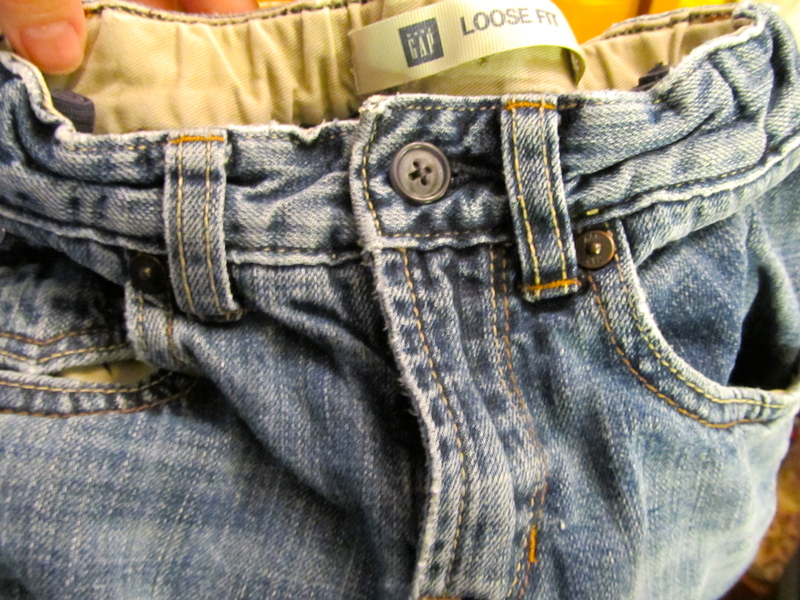 Jeans with broken snap replaced with a button. Well these jeans have seen heavy usage over the months. Because they were so long on him initially they fit perfectly now that we no longer cuff them up. Unfortunately the knees were giving out. I could tell at the last washing that with one more wear we’d have some impressive holes unless I acted right away. I rather like these patches… and more importantly so does Eli. 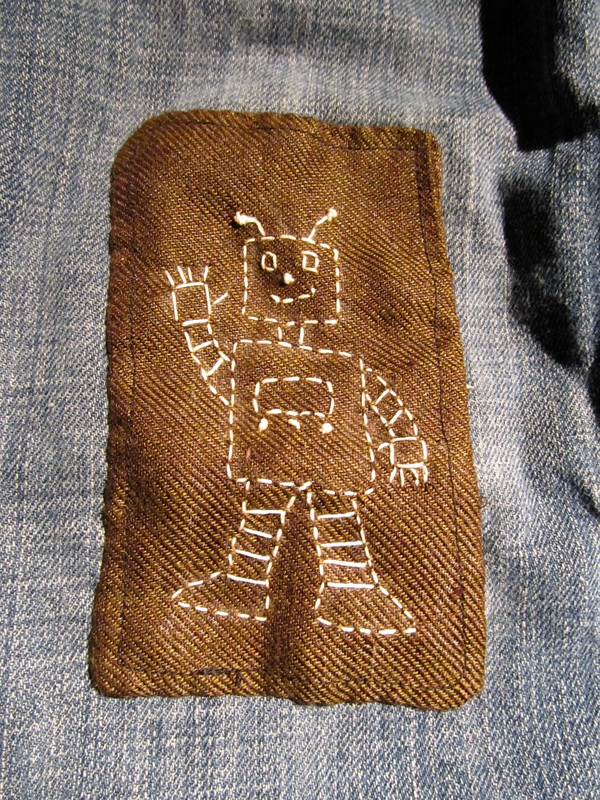 If your kid is going to wear patched clothing, the repair might as well add a fun element, right? Here are a couple of close up shots of Eli’s new knee-art. Eli’s not big on greetings. He needs to warm up before talking to people. Perhaps his jeans can go beyond the call of just providing for his warmth, protection and modesty and take on a bit of the pressure of social greeting expectations as well. Most likely though they’ll just give his knees a new degree of cuteness. I didn’t think to photograph the making of the knee patches because I wasn’t thinking about blogging or tutorials when I made them… I just wanted to save a favorite pair of jeans. But after they were done I thought they’d be fun to share. 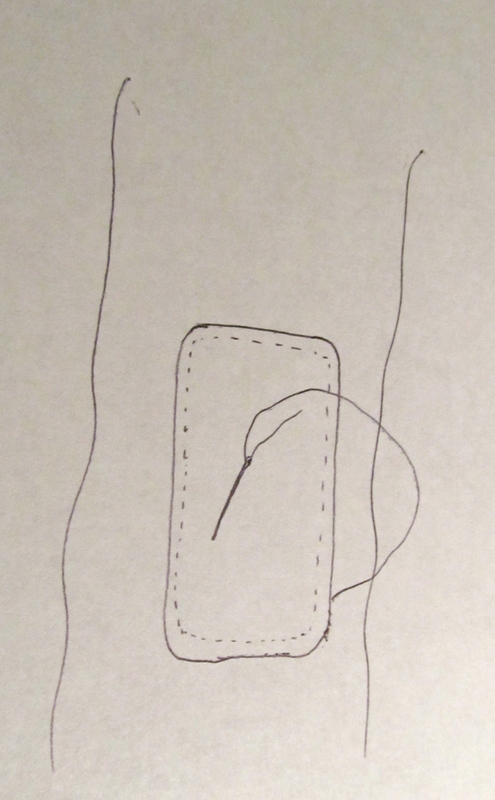 If you are currently pitching worn jeans or buying those stiff iron on patches you might be interested in this sloppily sketched carefully hand-drawn tutorial. I like this method because it doesn’t cost anything when I just use left-over scraps of cloth, is a double layer allowing me to use cute cloth that wouldn’t be strong enough to do a patch job on it’s own, and the patches are really soft, unlike the iron on patches used during my childhood (I saw they still sell those things in the fabric store). Cut out two pieces of fabric large enough to cover the hole or weak spot in the knee adding and extra 1/4″ all the way around. Place the fabric right sides together and sew around leaving a gap in the sewing on one side through which you will turn it right side out. When done snip off the corners to reduce bulk. Turn right side out. The strange looking pen marks to the left symbolize the gap where you didn’t sew. 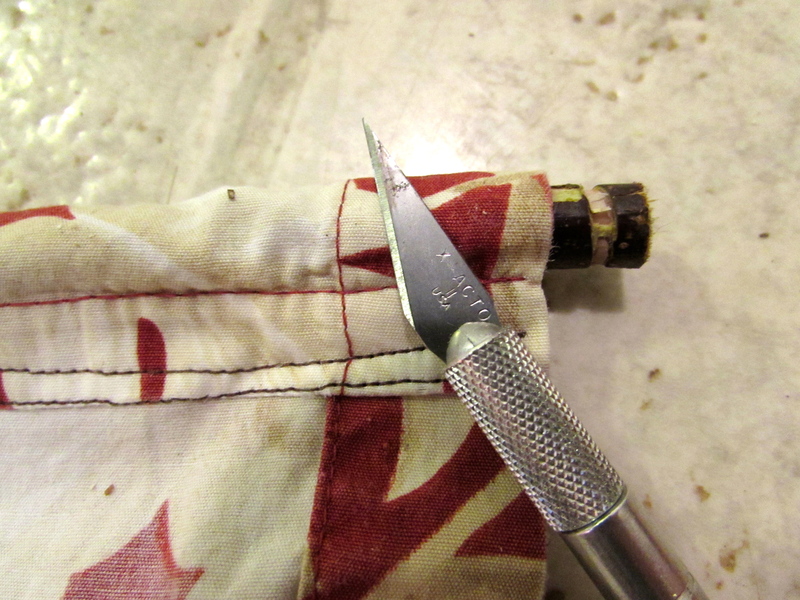 Tuck the raw edges of the fabric into the gap, pin and then top stitch all the way around the patch. Hand sew the patch onto the pants using a blind stitch. 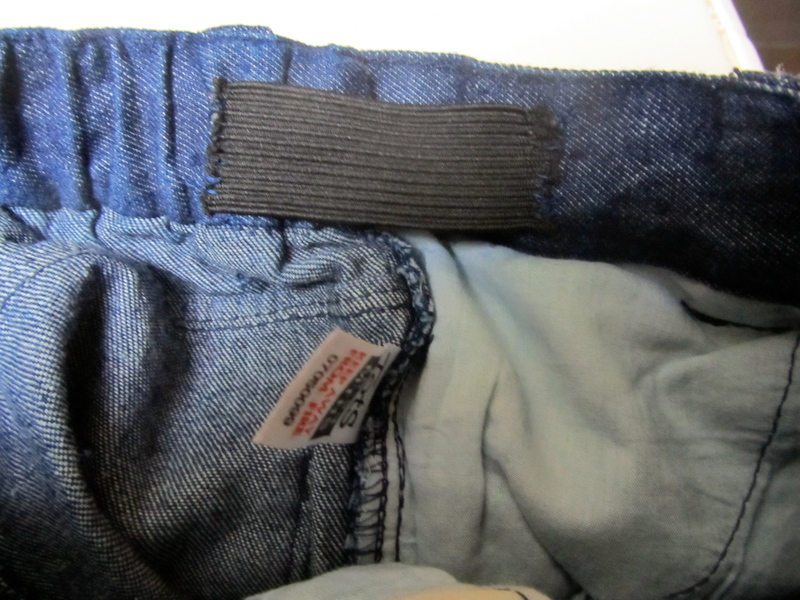 Be careful not to sew the front of the jeans to the back of the jeans as you do this. This is a good task to do while relaxing in front of the TV at night. You probably want to do any embellishing at the end of step 4 and before the patch is sewn onto the jeans. I didn’t with these… the idea presented itself after I had completed the repair job. It really wasn’t difficult to do even though I had already sewn on the patches. 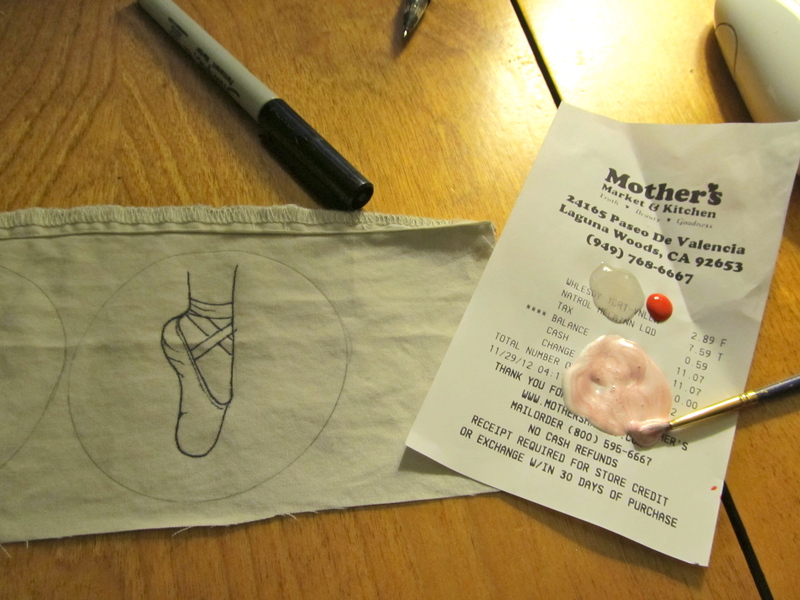 You can embroider, add an applique or a store-bought embroidered patch (you know, the decorative kind), or you could stencil on a design with fabric paint and freezer paper. 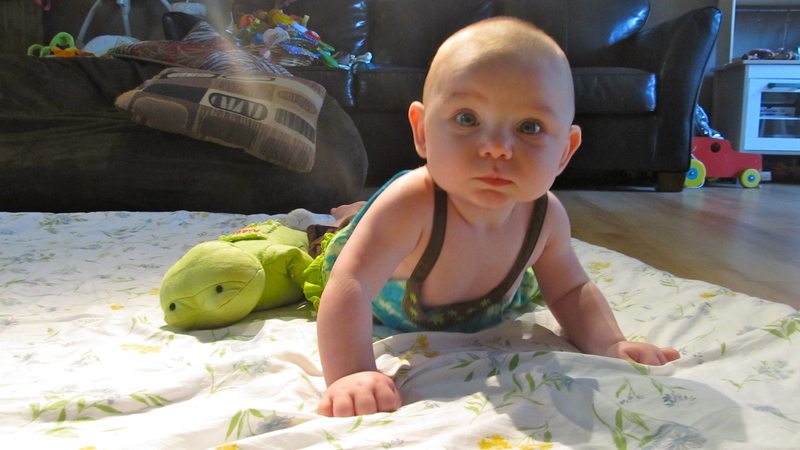 Or, if you chose to use some really cute cloth you could just leave well enough alone. Every year I make a Christmas ornament for my husband, my son, and now this year for the baby soon to join us. I try to commemorate a specific event or interest from that year. My goal is that eventually we will have a tree full of ornaments, each one carrying a special memory, instead of just pretty but generic store-bought ornaments. This Fall we took a trip together to Washington State and spent a couple of days on Whidbey Island. It was gorgeous. 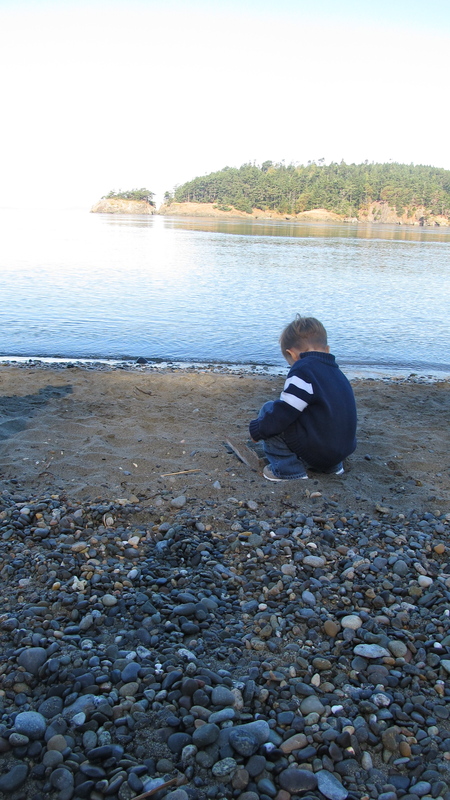 I loved the pebbly beaches at the edge of the evergreen forest. Eli threw rock after rock into the waves. 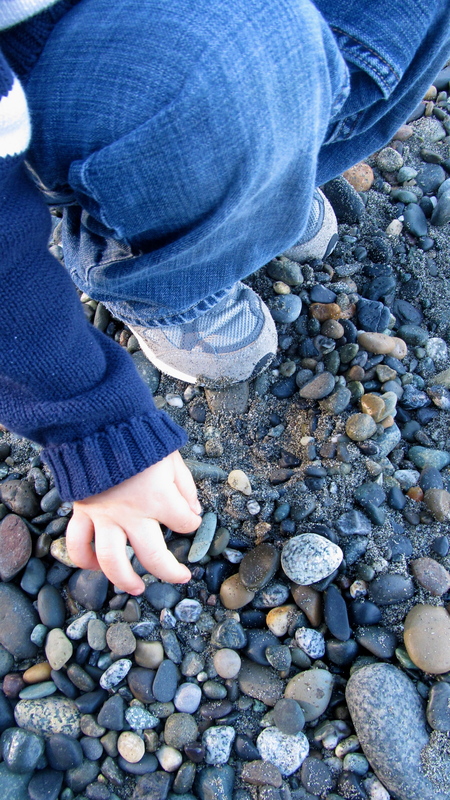 We brought home a few of those rocks which Eli enjoys playing with on an almost daily basis. I stole a couple from his collection for the purpose of making ornaments that will remain with us for years after Eli’s play rocks have been scattered and lost. I was inspired to use this technique by seeing this blue agate wire wrapped necklace and earring set from A Little Bit of Craft. 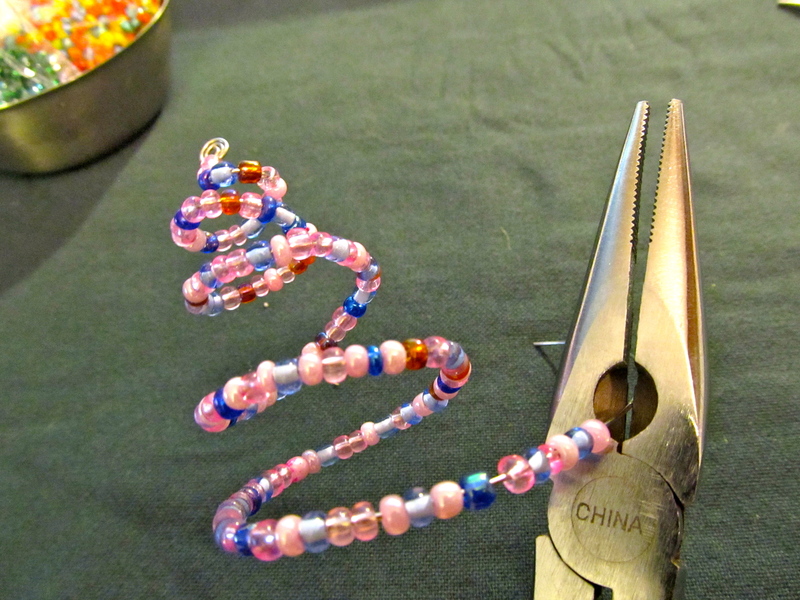 I began by sliding a bead onto the wire and twisting the wire around it to hold it in place. 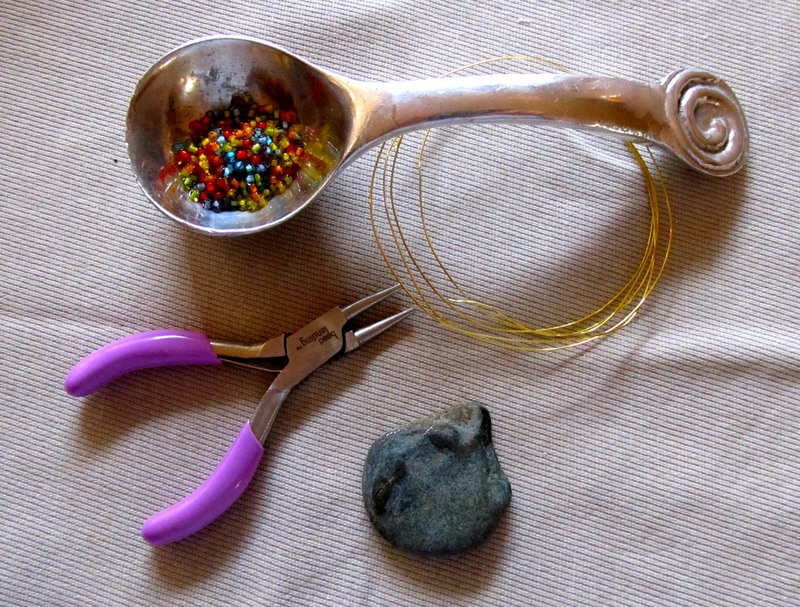 The length of the wire you will use depends on the size of your stone and how many times you want it wrapped. 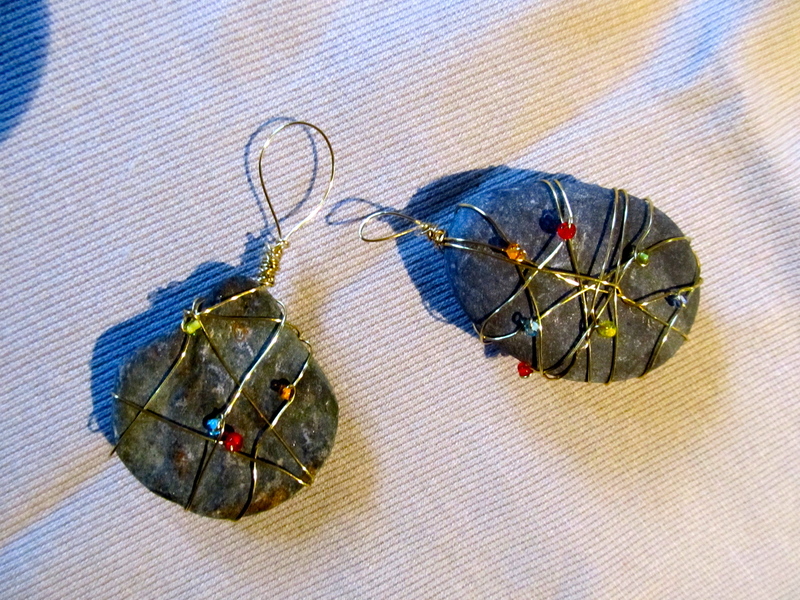 Then I picked up my stone and stared wrapping. 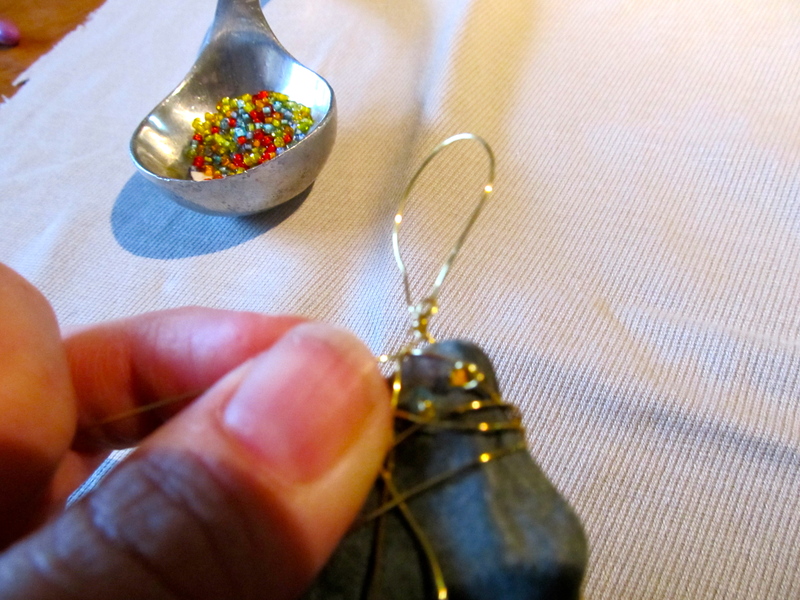 It can be a bit challenging to keep the wire tight so it doesn’t slip out of position along the edge of the stone. A flat shaped stone works much better for this project than a stone that curves on every side. 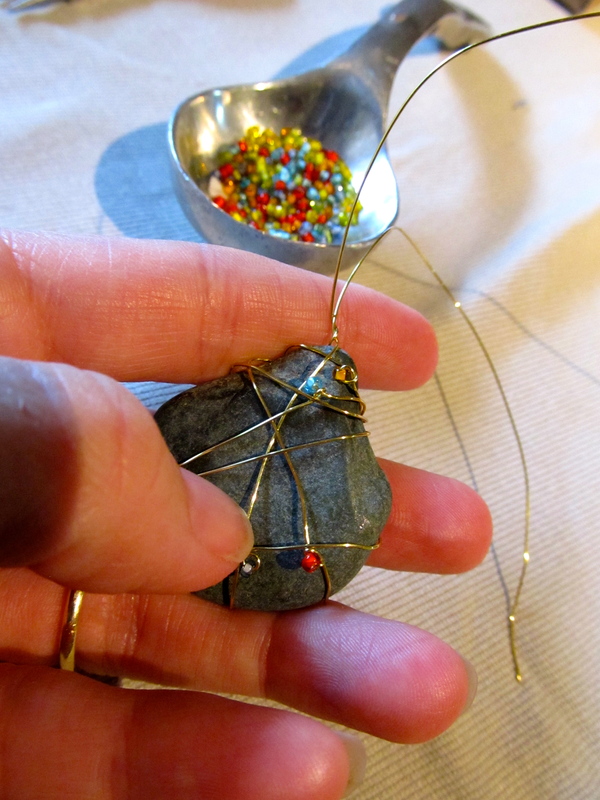 When it looks like you have as much wire and beads on your stone as you want, or you are coming to the end of your wire work both ends up to the place you want to be the top of the ornament. Give them a couple of twists to hold them in place. 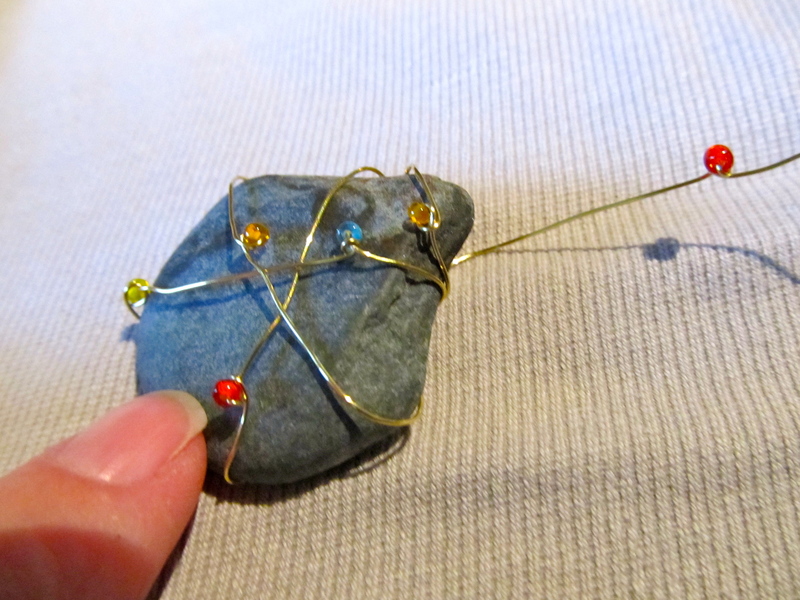 Now form one of the wires into a little loop and wrap the other wire around it where it meets the rock. 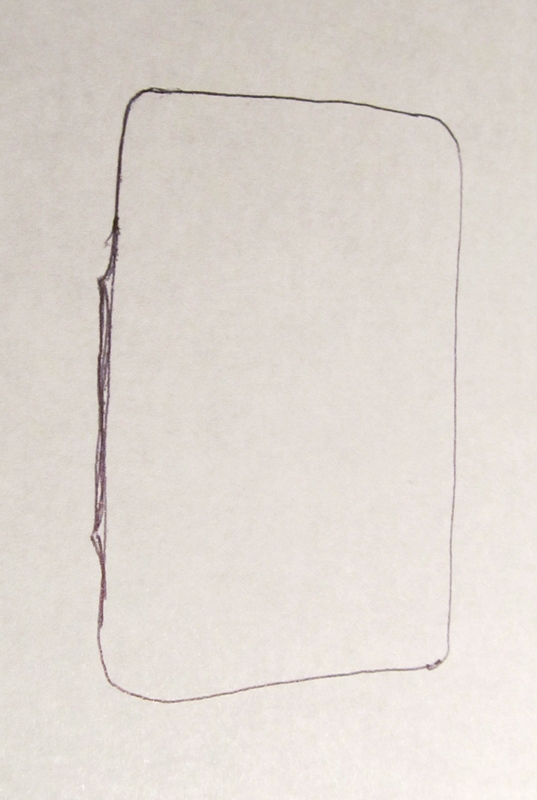 Then wrap the end on the loop around a few times too so it won’t just slip out later. 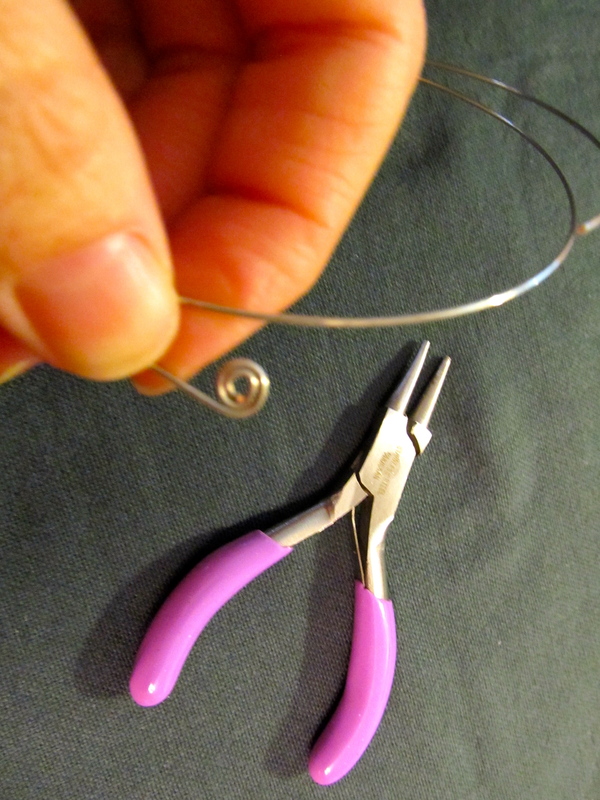 Trim off the excess of the loop wire and then continue wrapping the second wire to fully cover the pointy end. At the end tuck in the end point of the wrapping wire. Add a whatever kind of hanger you’d like and your ornament is complete! It seems like it has been forever and a day since I’ve had a tutorial to offer. 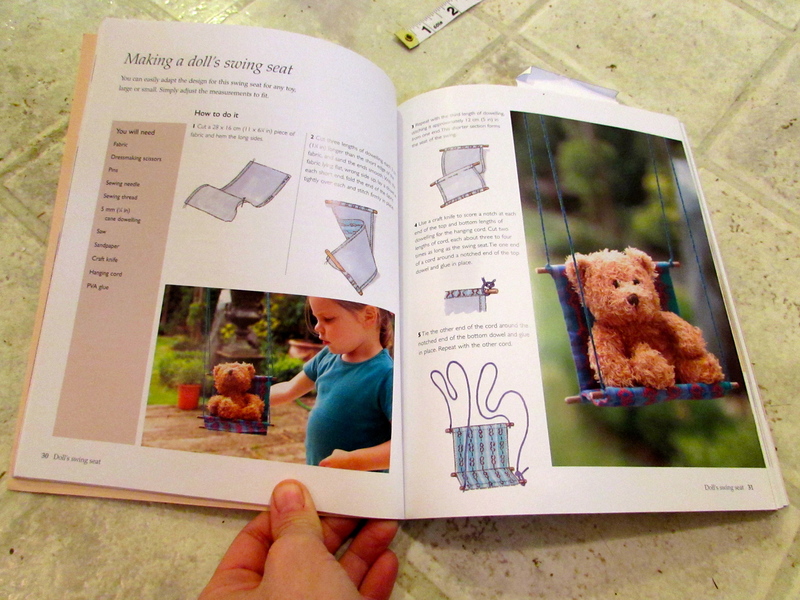 But today I’ve got a quick, easy and ever so useful sewing project for you, so let’s get started! Eli has been needing some new warm pajama pants. He pretty much refuses to sleep with any covers over him at all so with cooler weather around the bend (or at least I dearly hope so, November and tomorrow we’re supposed to hit 91 degrees) I wanted to make him something nice and snuggly. I’ve been doing most of my sewing reusing fabric from old clothing, requiring limited expenditure to support my habit other than thread and elastic. 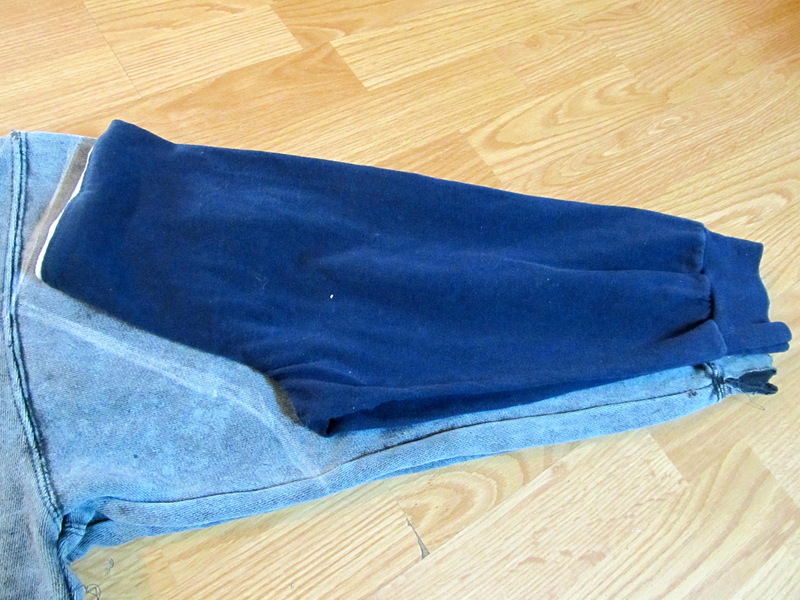 By making yoga pants I don’t need any elastic at all, I can further make a dent in my overwhelming pile of clothing to be repurposed and I can make super comfy clothing at the same time. 1) Find an old knit long sleeved shirt from which you can use the sleeves as pant legs. The bigger your child the larger the shirt required. Eli is 2 1/2 and wears 3T pants and I was able to use men’s size large for these pants. I made one pair from a t-shirt and two from heavy sweat shirt material. 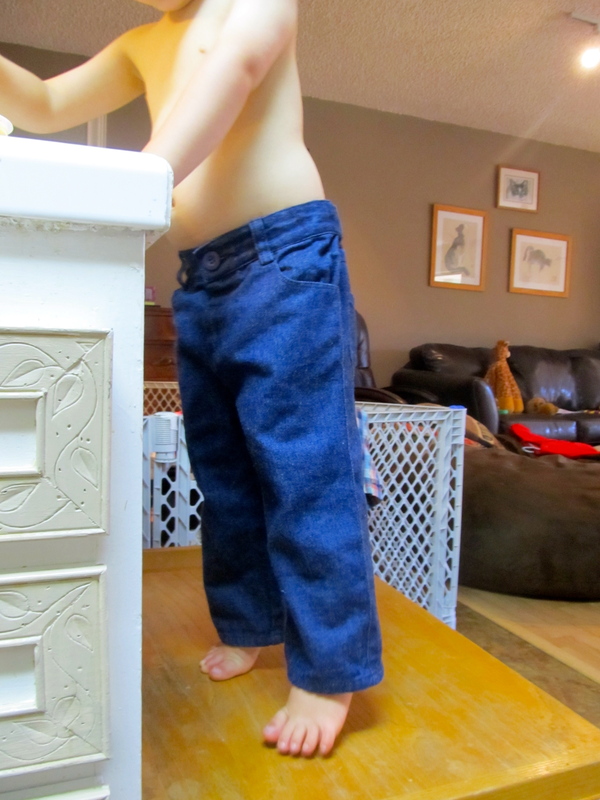 2) Place a pair of pants that fit your child well, folded in half, on a shirt sleeve. Trace around the crotch and across the waistband adding a little extra space for seam allowance. I didn’t measure but it was about 1/2″. 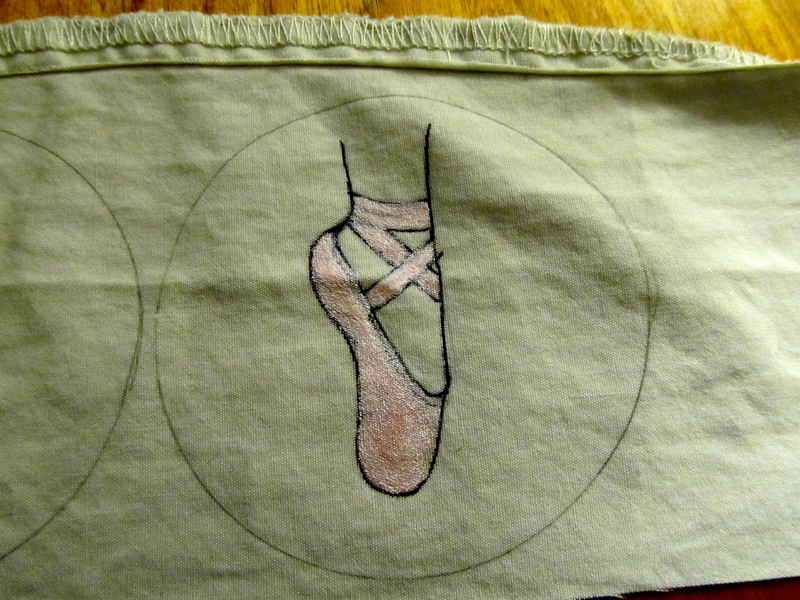 I used an existing pair of yoga pants here so I folded down the waistband before tracing. 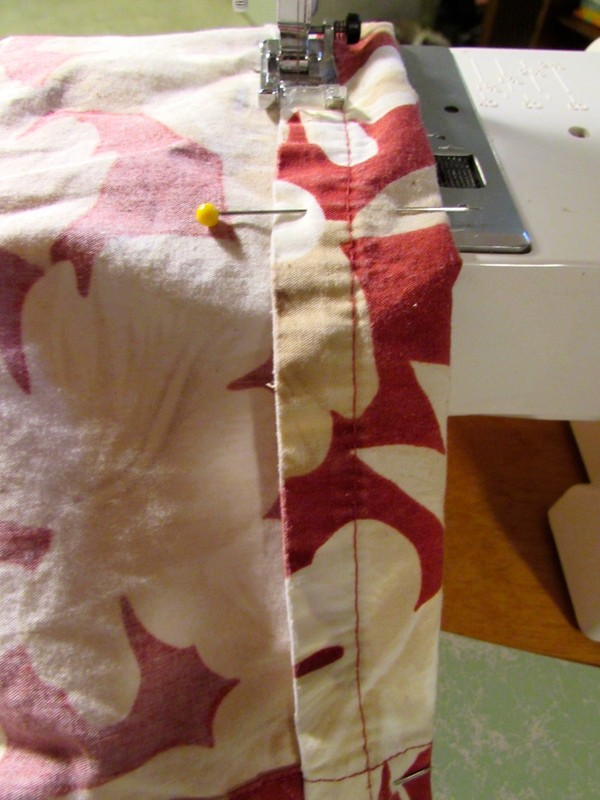 If you are using a pair of pants with an elastic waistband to trace you may want to make the top of these pants 1/2″ shorter as you will be sewing the yoga waistband onto them later. 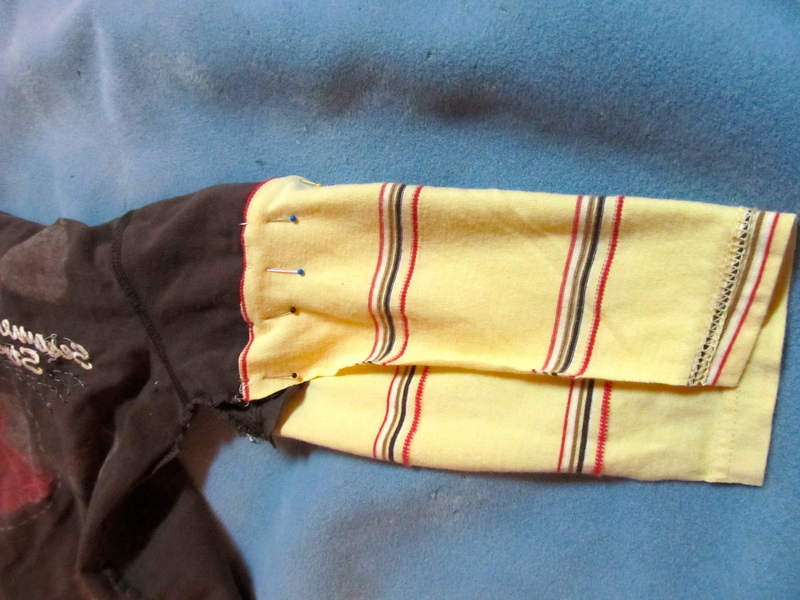 3) Turn one sleeve inside out and fit the right side out sleeve into it so they are now right sides together. 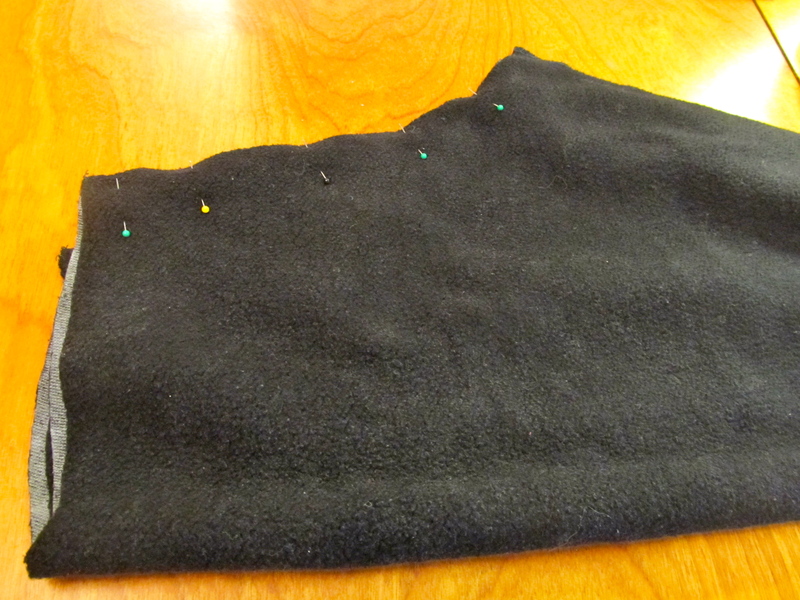 Pin all the way around what will be the center seam. 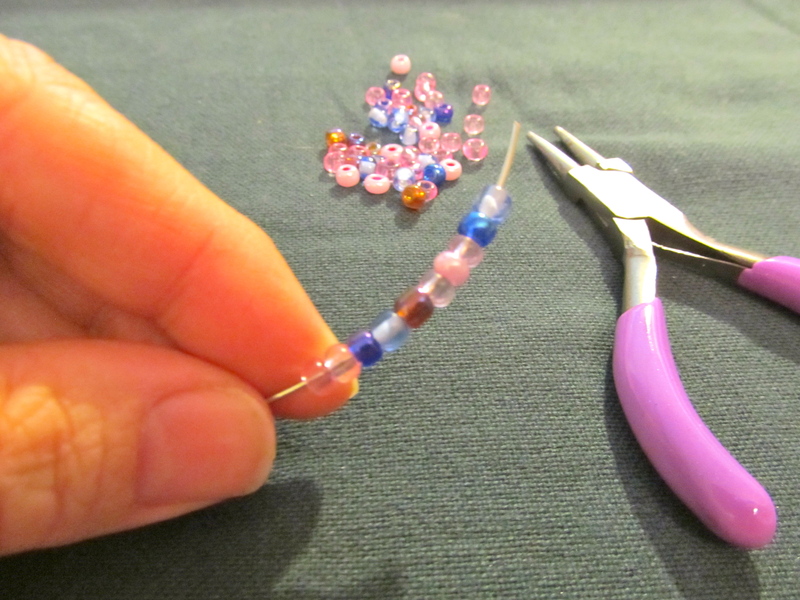 Sew with a zigzag stitch. 4) Turn the pants right side out and set aside. Now it is time to make your yoga waistband. 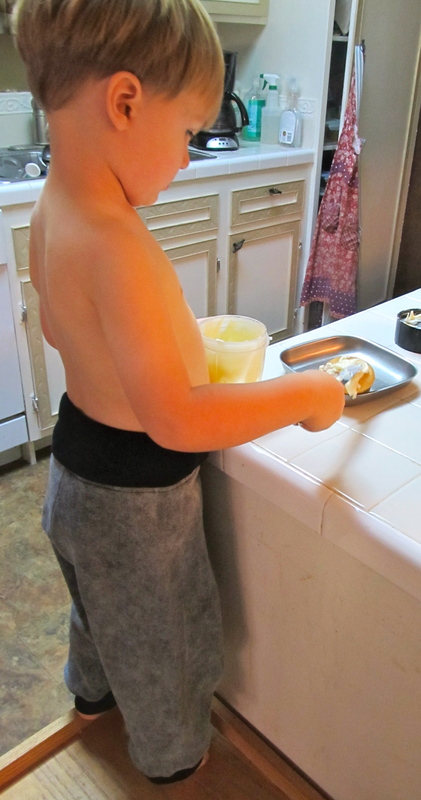 Measure around your child’s waist, subtract 3″ and divide by 2. 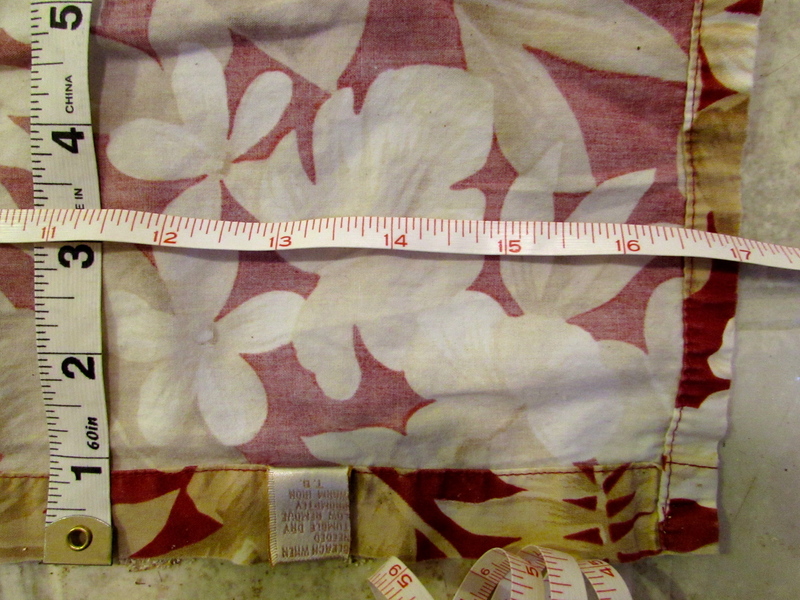 This is the width of the two pieces of cloth you will need to cut out to form the waistband. 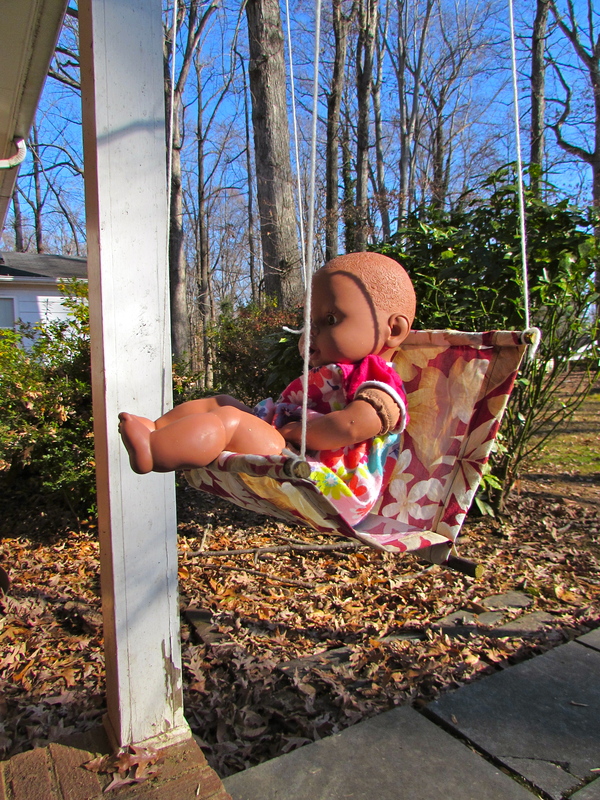 The height of the rectangles should be 15″ regardless of the size of the child. (A great source for this complete with diagrams is here at the Sew Mama Sew blog where you will find a tutorial for a yoga waistband skirt.) 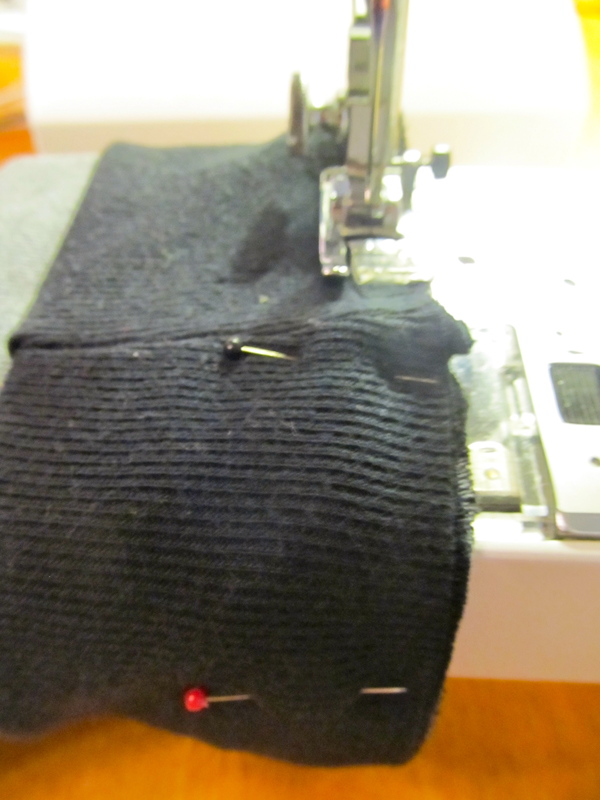 Using ribbing or a super stretchy t-shirt cut out the two rectangles making sure the stretch goes from side to side. 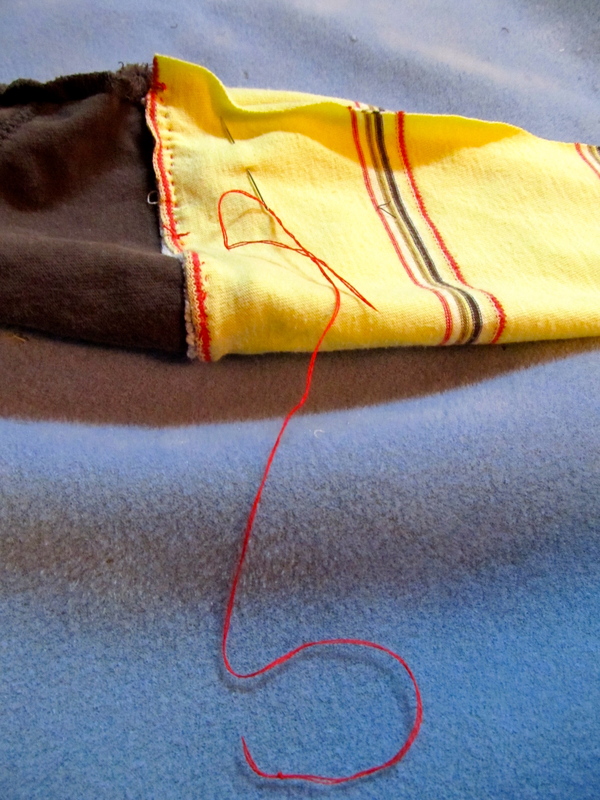 5) Sew up each side with a zigzag stitch. Press seams open. 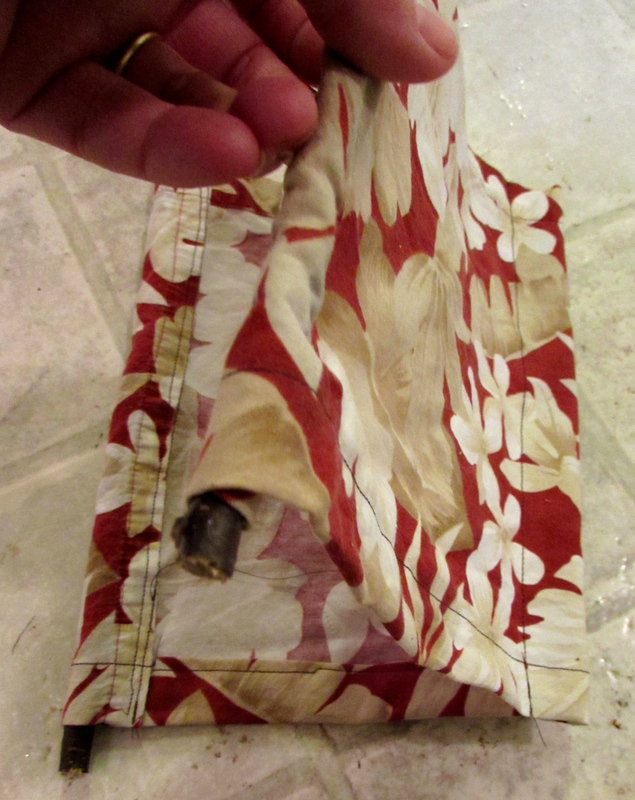 6) Fold the tube in half so that the two raw edges are matching up and the seam allowance is sandwiched in the middle. 7) Slide the tube over the pants so that all three raw edges match up along the top of the pants, and the folded edge of the tube is hanging down. Because the tube will be more narrow than the top of the pants, stretch the tube so you can pin it around the top of the pants. 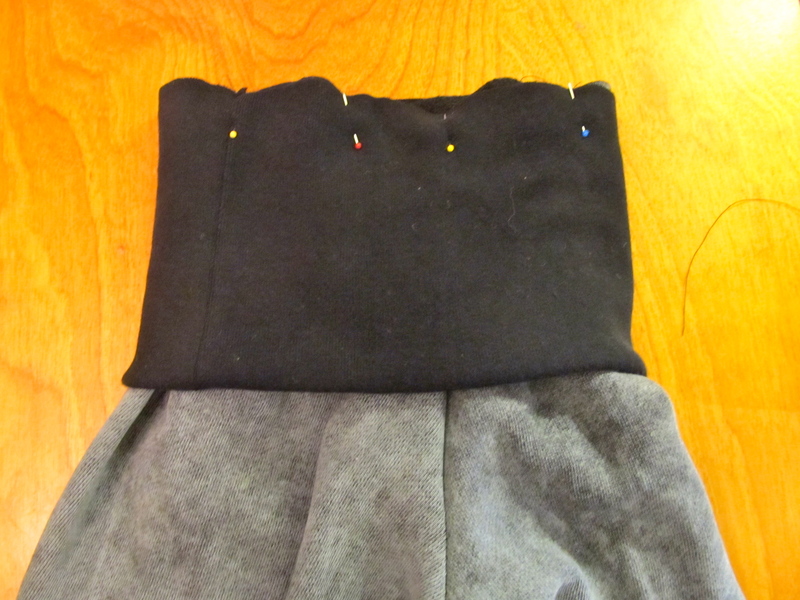 I find it helps to pin the two sides first at the side seams of the waistband. 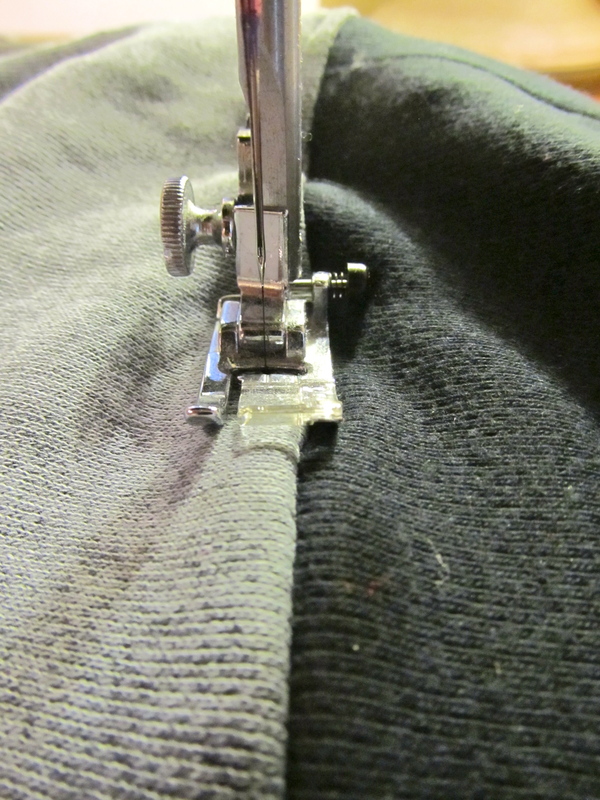 Then stretch it out from side to side and pin the center points at the center seams of the pants. Then pin twice between each of the first four pins. 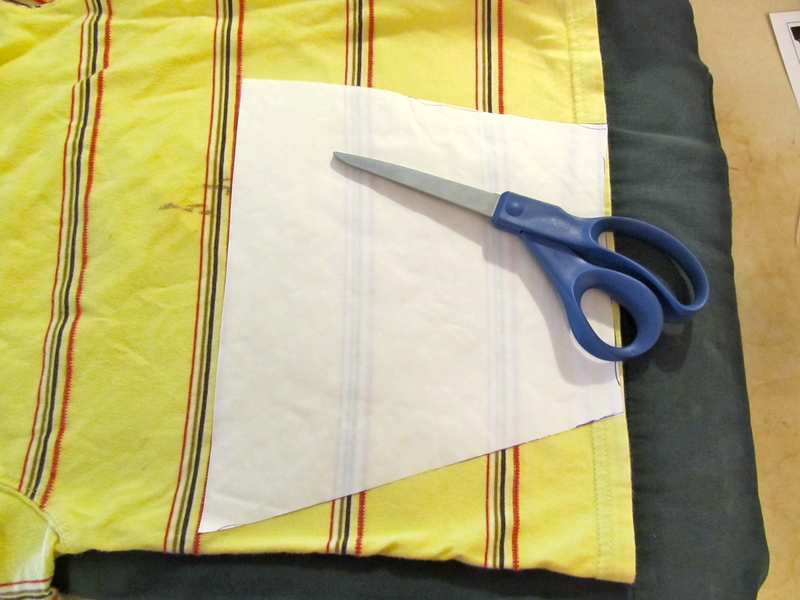 8) Sew all the way around with a zigzag stitch. 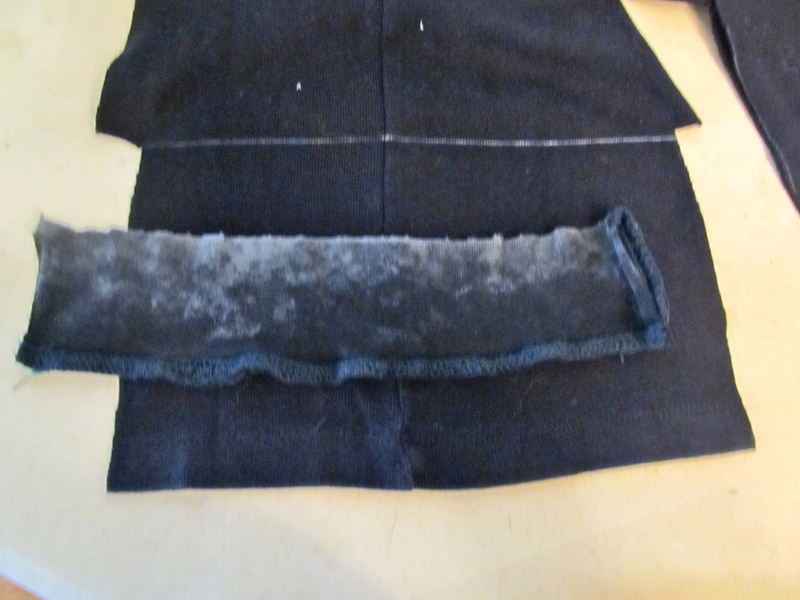 9) Flip waistband up and top stitch all the way around with a straight stitch. If the sleeves you chose to use were in good condition you’re done! 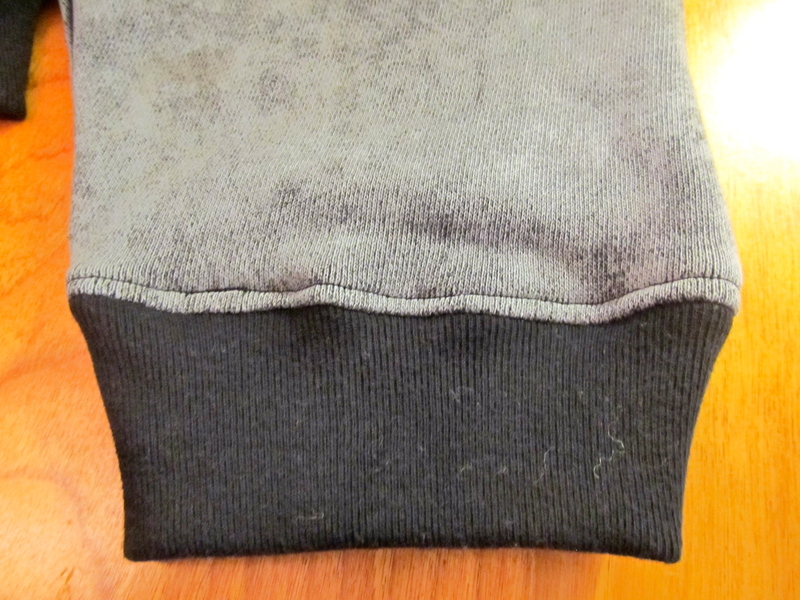 If however they were like the sleeves of the two sweatshirts I used the cuffs will be ratty and dirty. 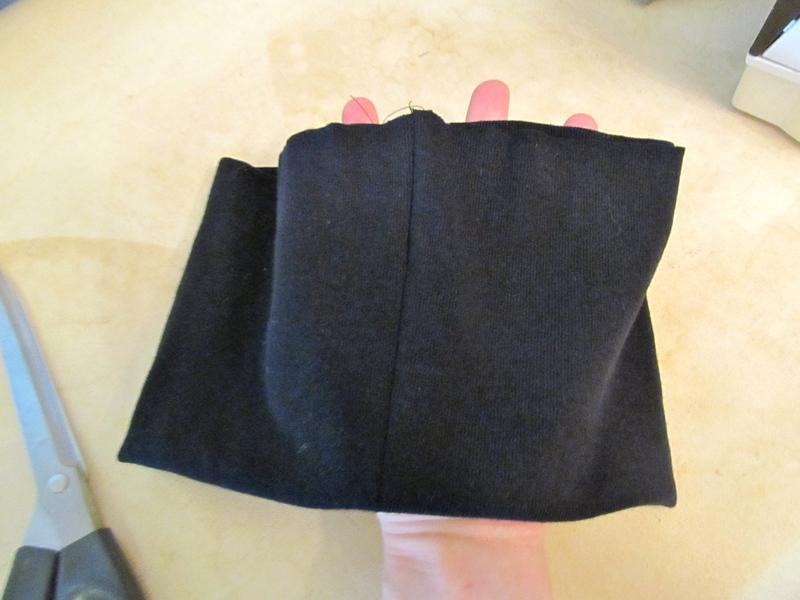 10) Remove the cuff from each sleeve. 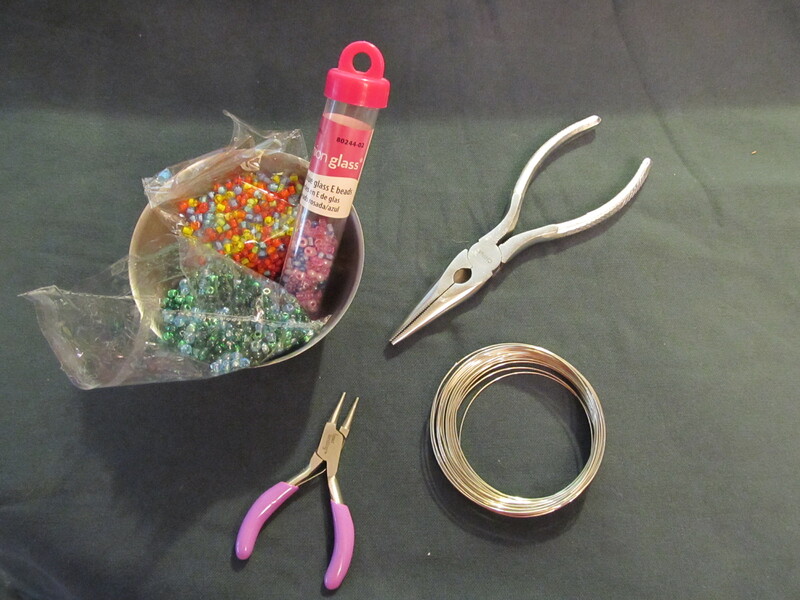 11) Use one of the cuffs to cut measure the amount of fabric to use for your new cuffs. I used the same shirt I used to make the waistband. 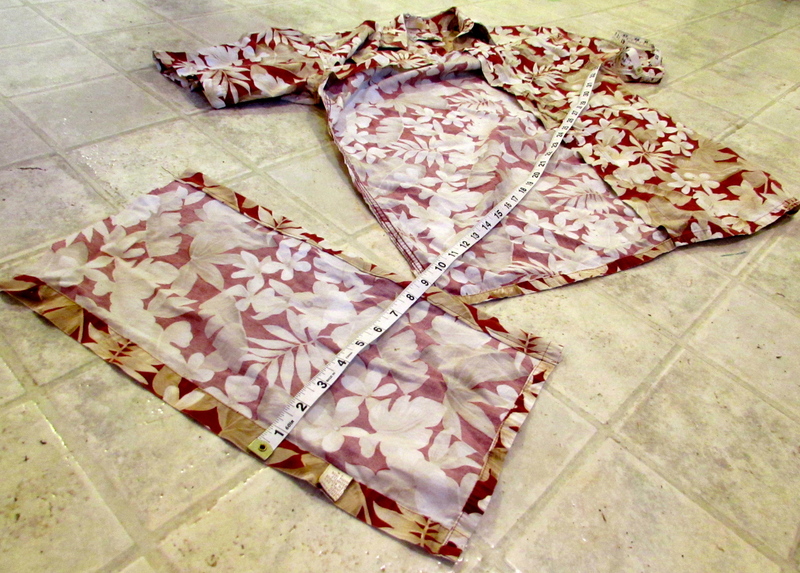 (This shirt gave enough fabric for two waistbands and four cuffs.) Open up the old cuff to find the length of fabric for the height you want enough so that you can double the fabric over as you did the waistband. Now you are done… the pants are ready to be worn! 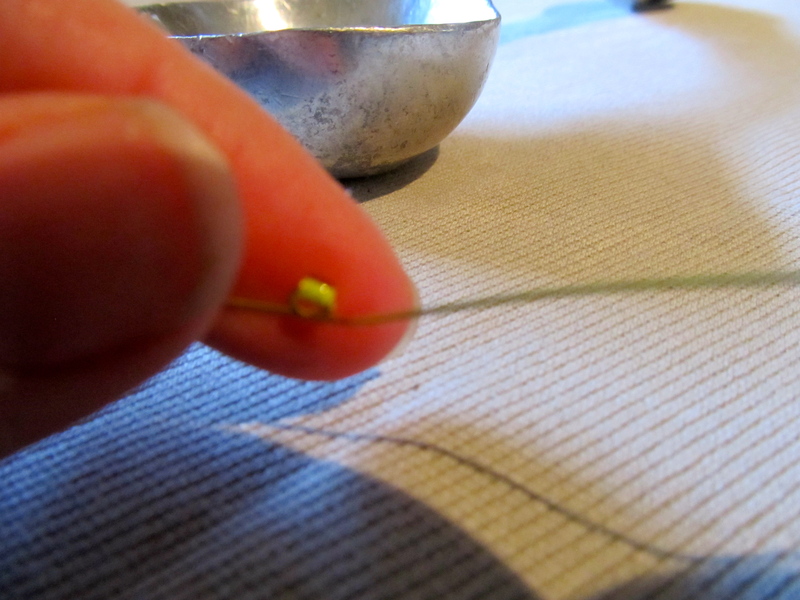 I’ve been doing a lot of mending lately, most of it makes for pretty dull blog fodder, but it has to be done. 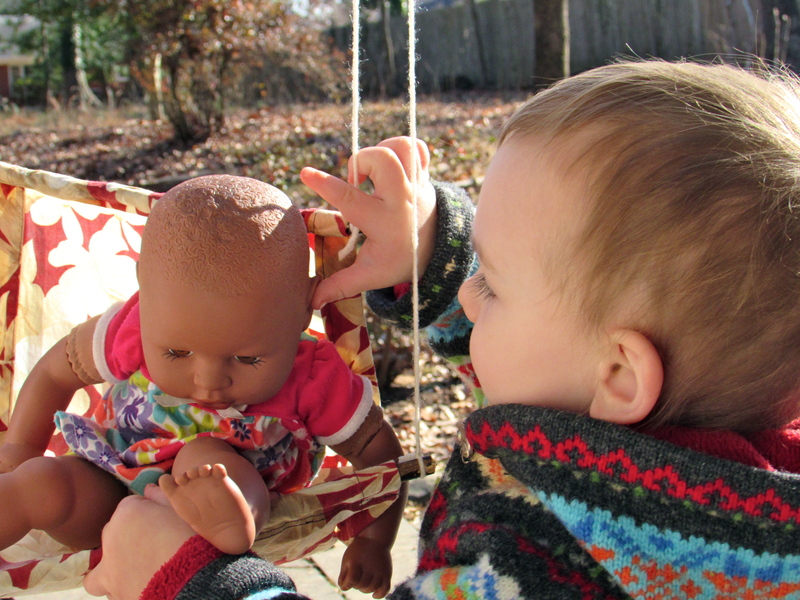 I’ll share this particular fix though, because for how very simple and seemingly uninspired it is I actually spent a couple of days trying to figure out how to attack the problem of toddler pants that constantly migrate south. Eli received this pair of pants as a gift over a year ago and I have been awaiting the day when he would finally grow into them. Lengthwise they are now perfect, but they are just a smidge too wide to actually stay up. Even the best looking pair of pants fail to look their best when slipping below the derriere in public. 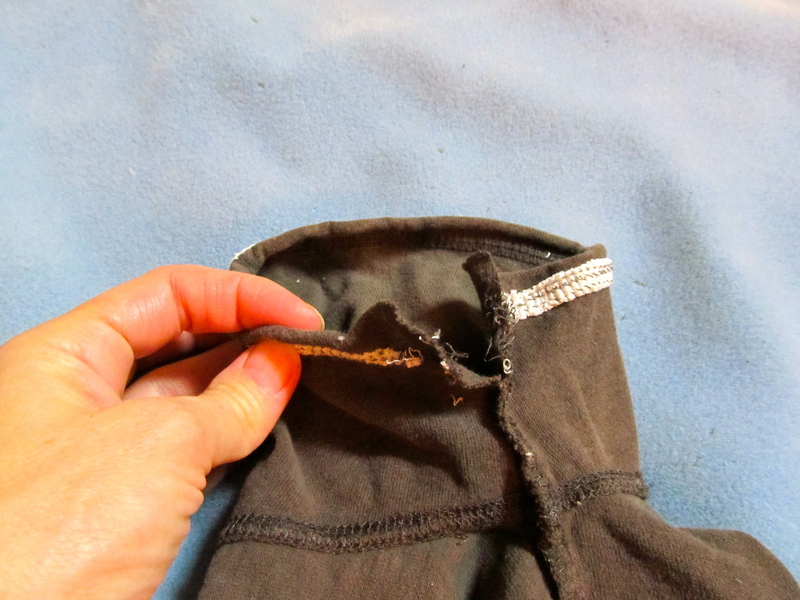 I had found this excellent and easy tutorial for fixing this problem, but since these pants unbutton I couldn’t run a complete circle of elastic all the way around the inside of the waist. Instead I just attached a small length of elastic to each side. It is whipstitched on each end by hand and will be super easy to remove when Eli grows a bit wider. Simple, huh? So why did it take me a few days to figure it out?? Sigh… But now he’s wearing the pants, and actually objects to removing them, so it’s all good.